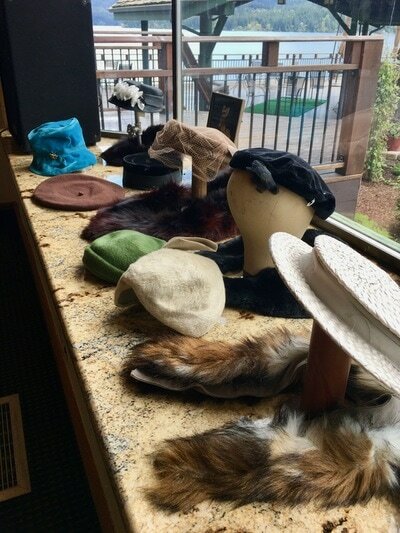 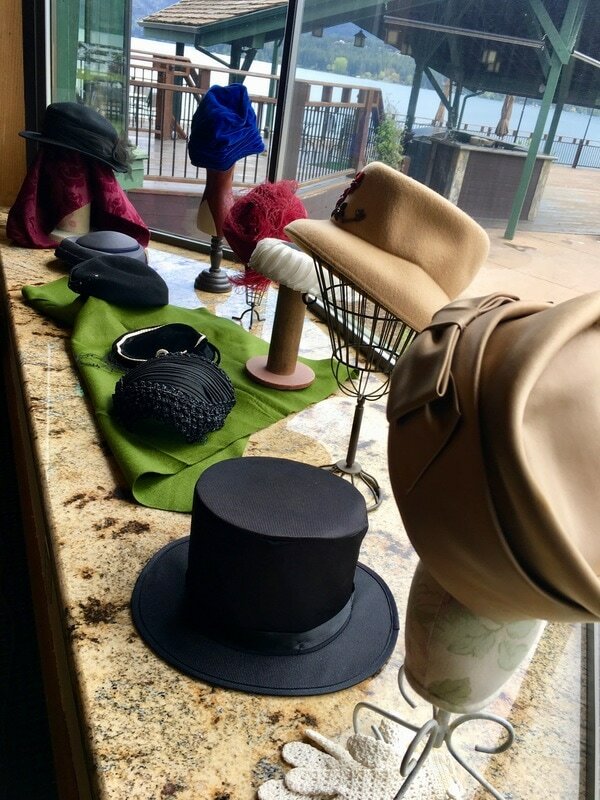 The theme of today's meeting was "A Hat Affair," and we saw hats of all shapes and styles. 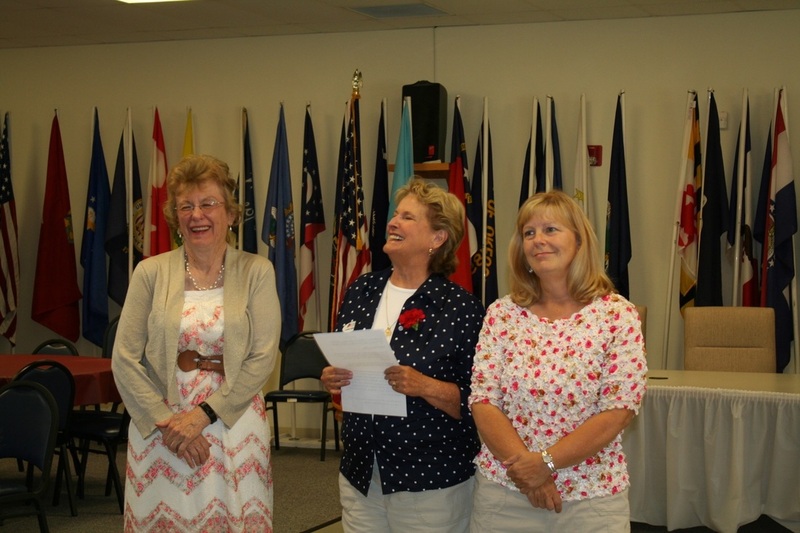 Pamela T. and Janet H. took awards for "Most Original" while Kathi J. and Barb N. took awards for "Most Attractive." 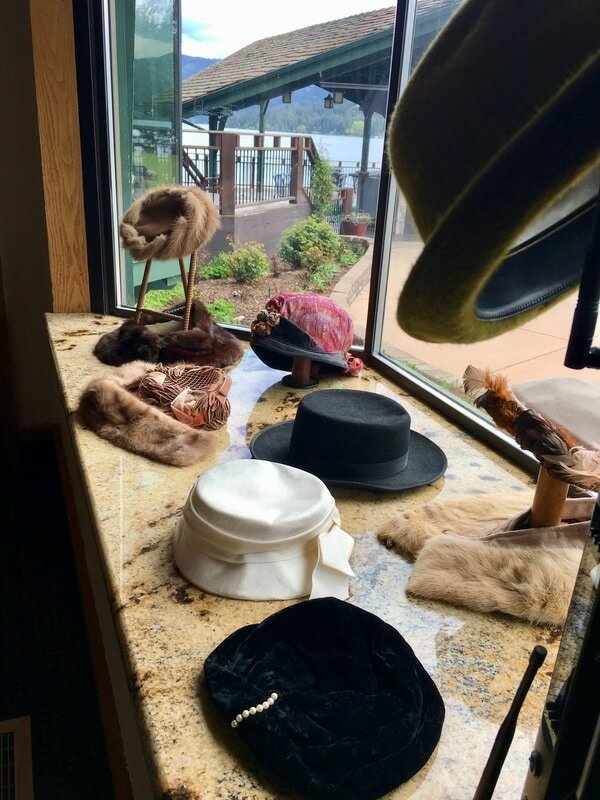 Pamela T. set up beautiful displays with vintage hats. Our new officers were installed, ready to begin their duties. 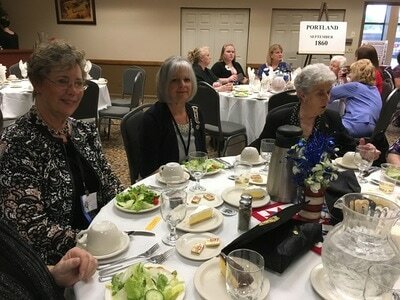 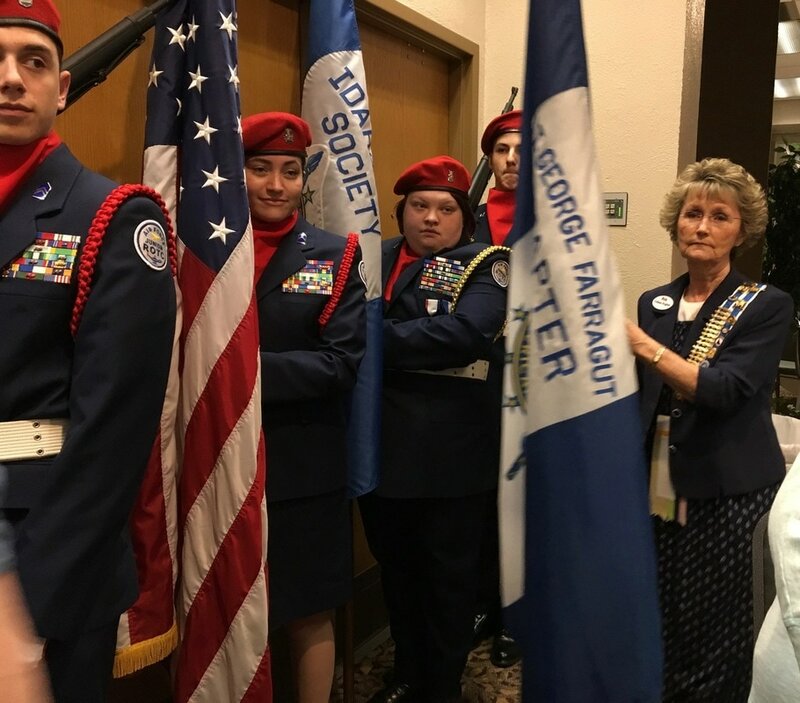 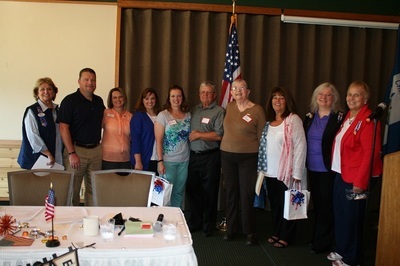 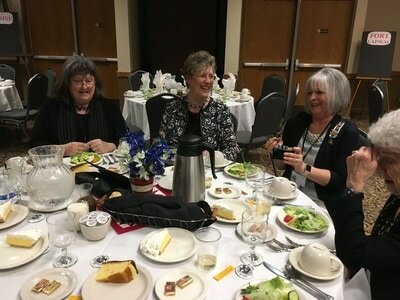 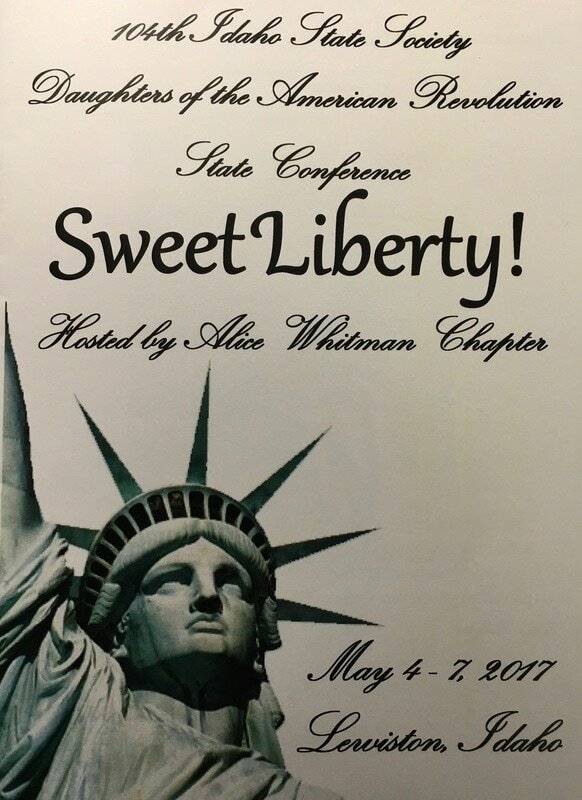 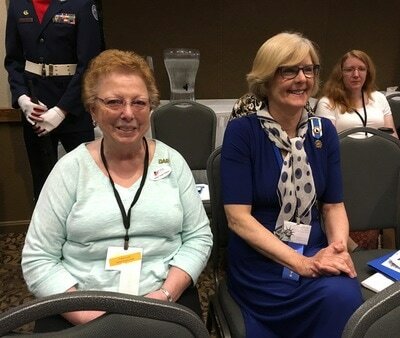 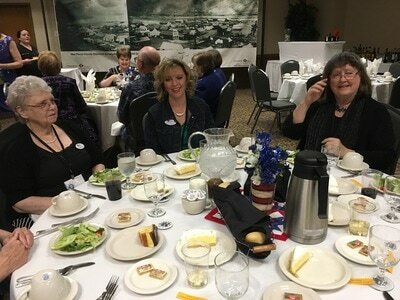 Lt. George Farragut Chapter was well represented at our state conference in Lewiston. 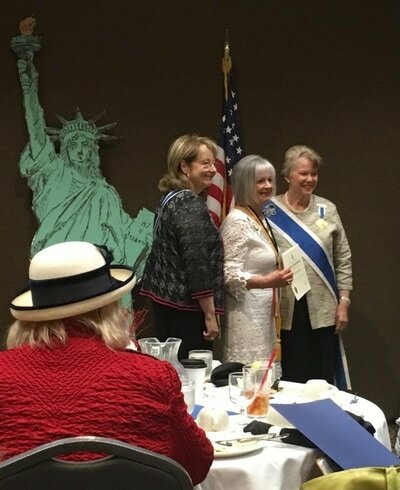 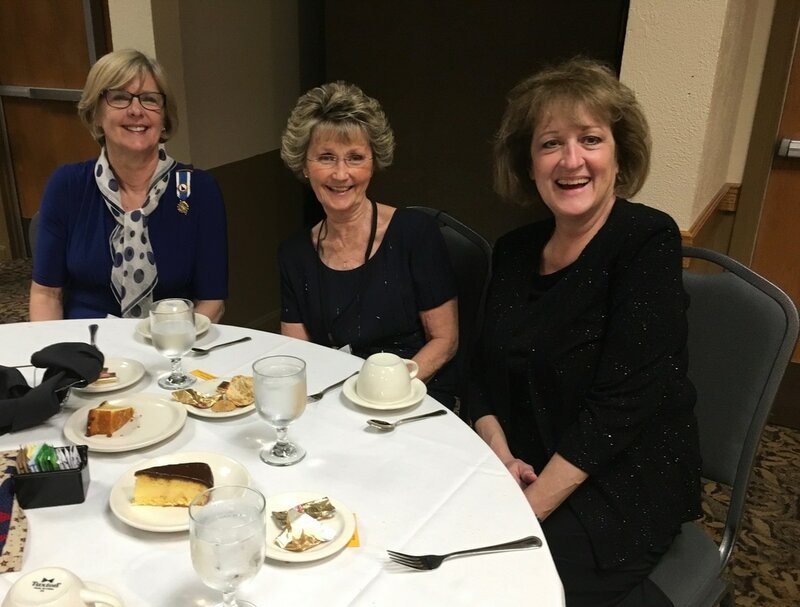 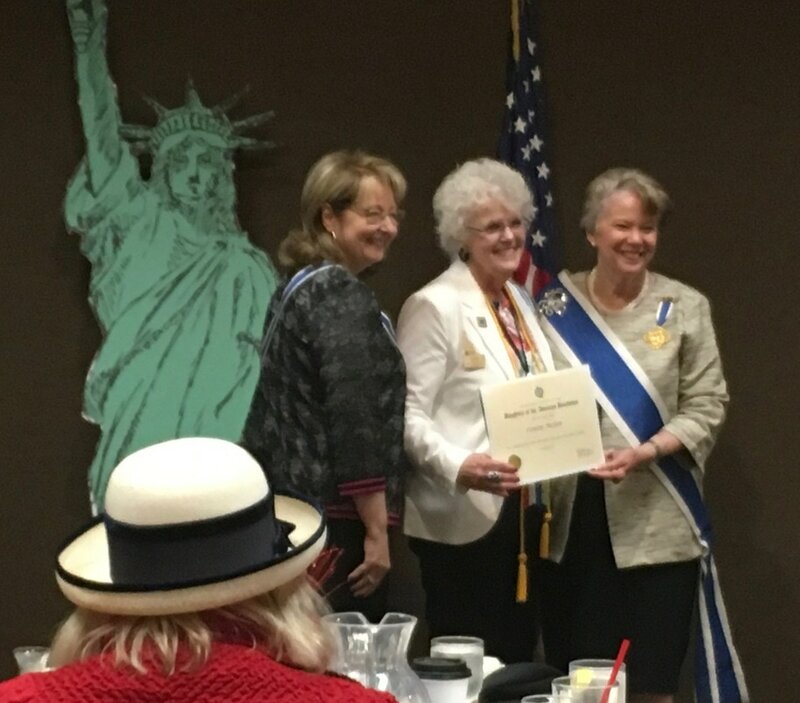 Three of our chapter members, Colleen E., Connie M., and Catherine M. received special recognition with President General Ann Dillon and State Regent Rhonda Kren at the Awards Luncheon for completing the 2017 New Horizons course. 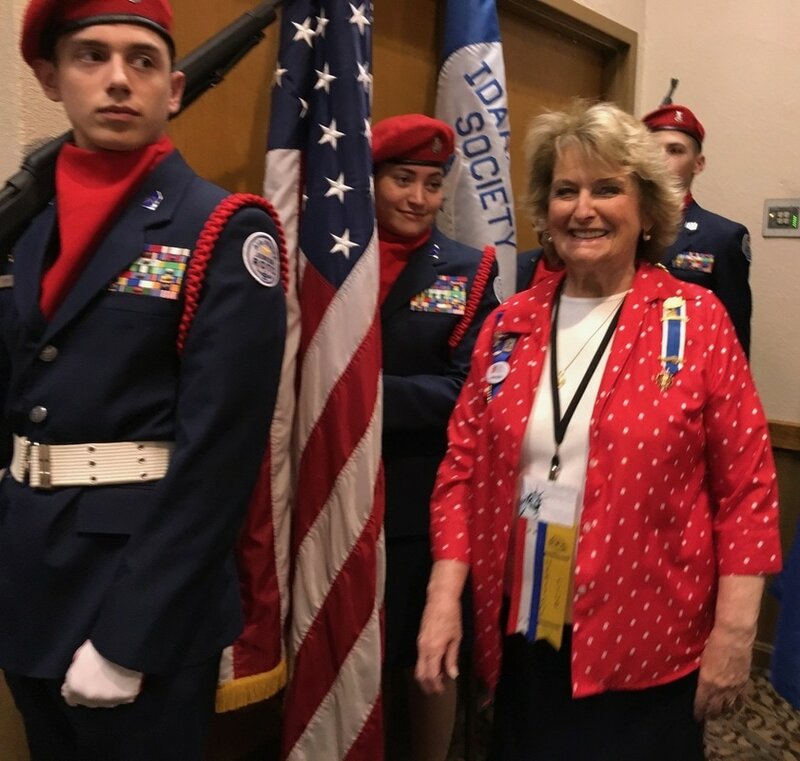 Catherine was also recognized as an Honorary State Regent Page. 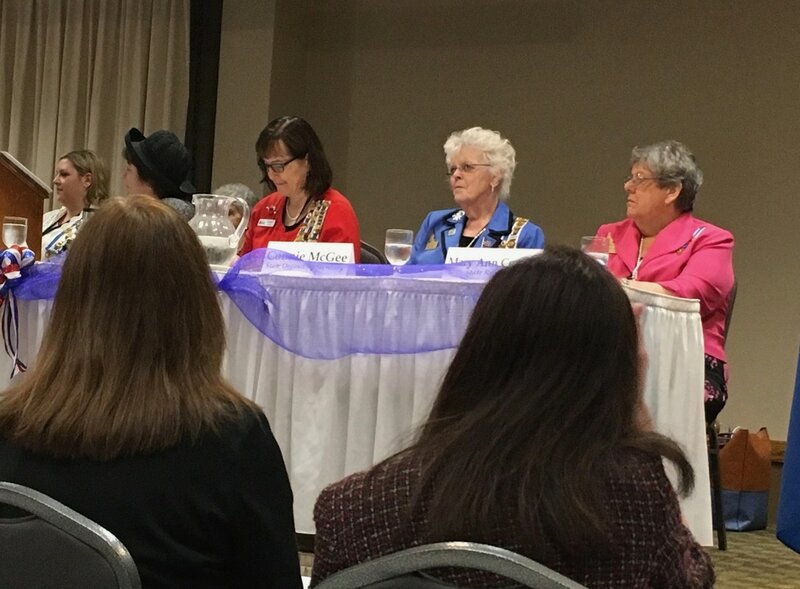 Four of our members, Sandra C., Jean V., Liz J. and Connie M. attended the Cameo breakfast. 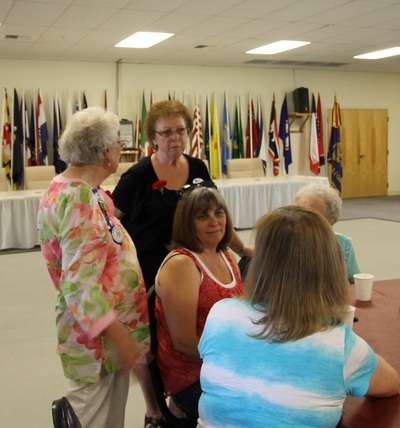 Here are more photos from our wonderful weekend in Lewiston. We can be serious. 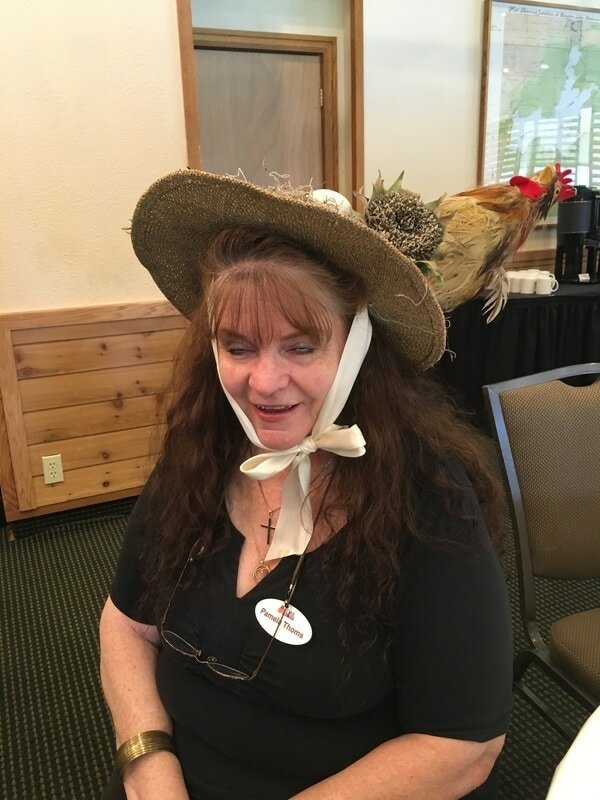 We can be silly. 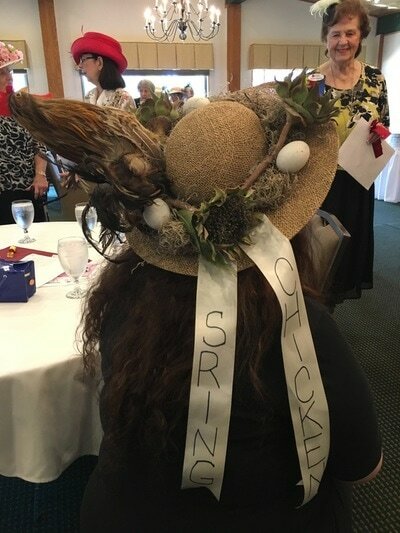 And we can be fashionable! 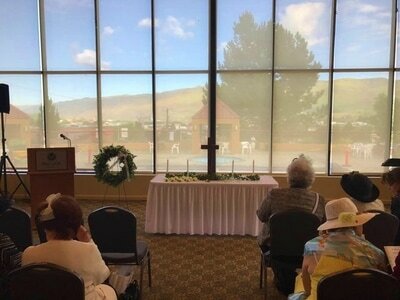 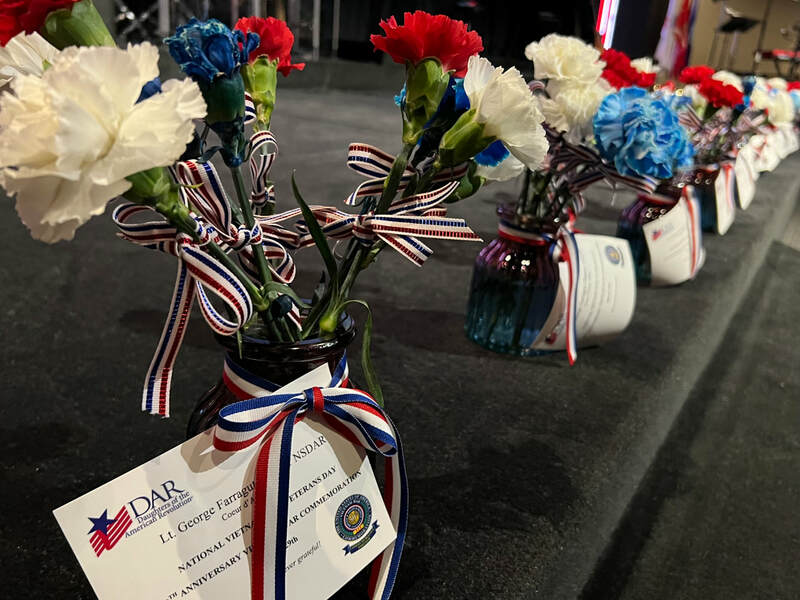 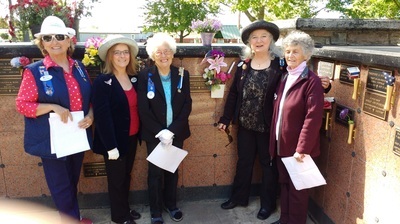 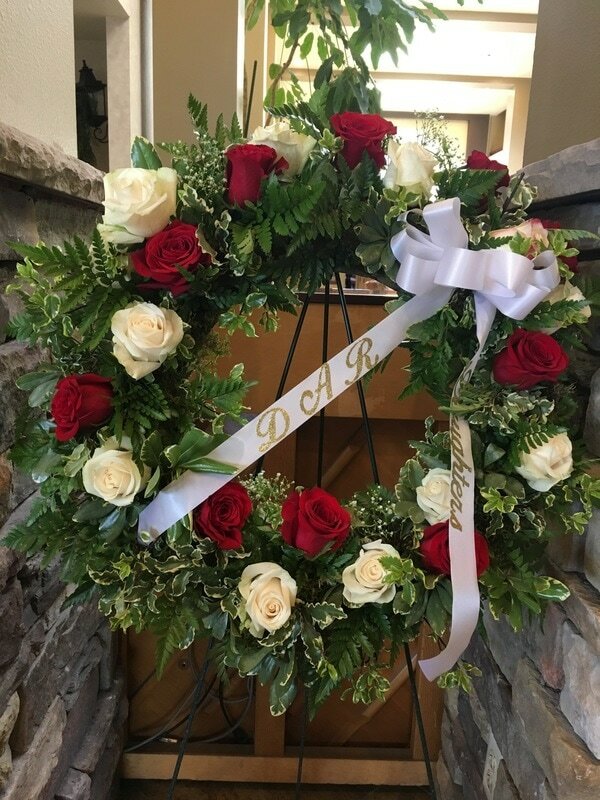 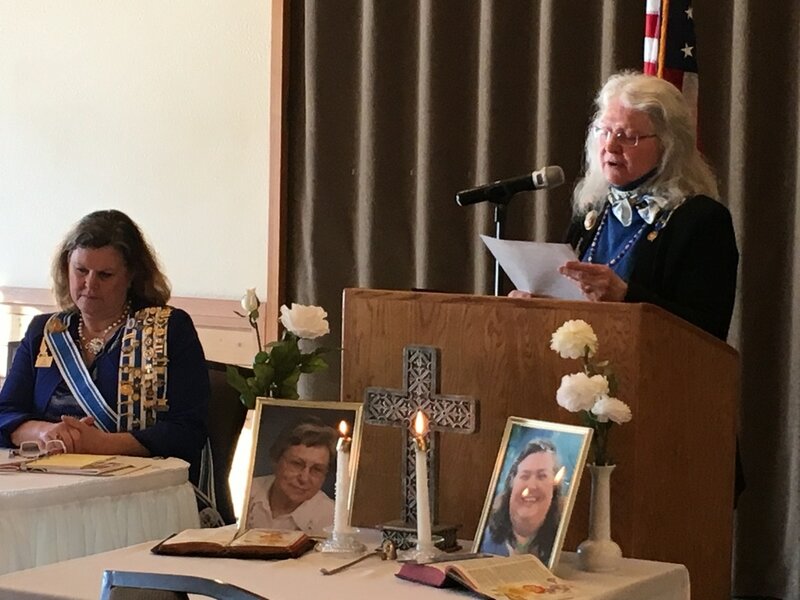 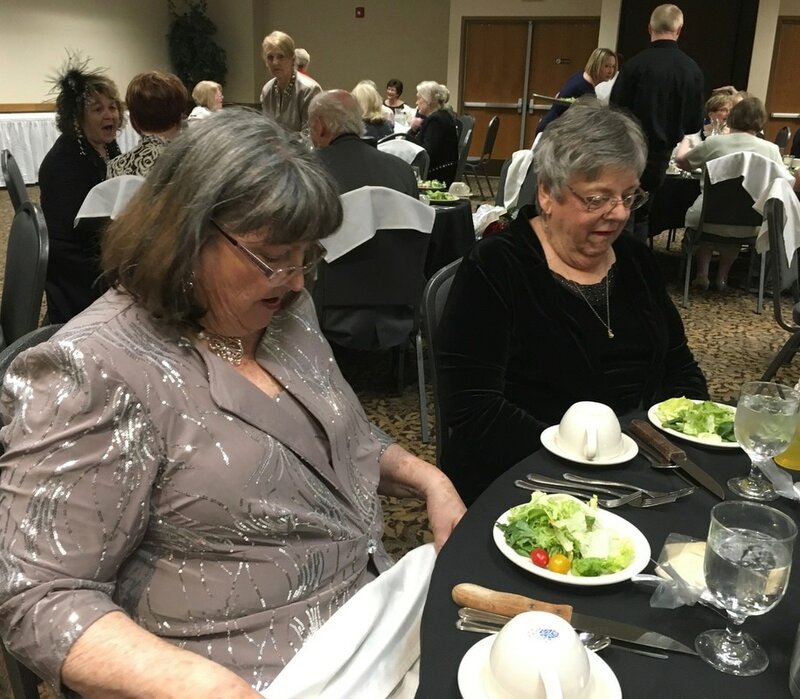 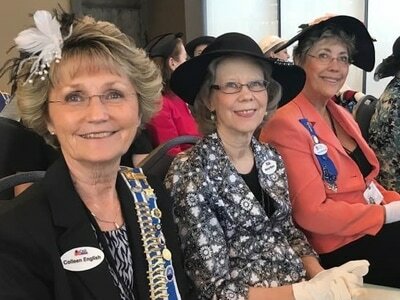 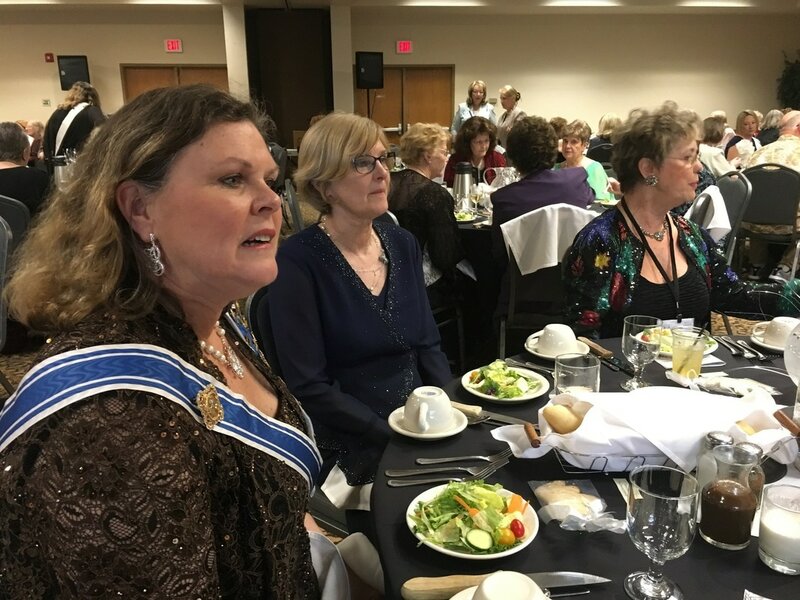 ​Departed chapter members Jennifer Henage, Betty Schmel, and founding member and Honorary State Regent Helen Walton Naslund were remembered at the memorial service where members donned hats and white gloves to pay respects. 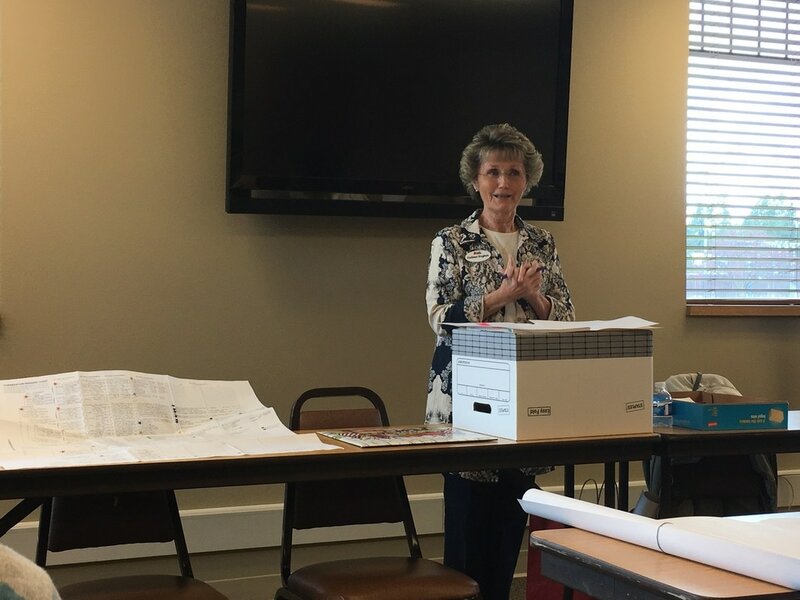 For her capstone project for DAR's New Horizons course, Colleen E. presented an outstanding workshop for those wanting to know more about DAR supplemental applications. 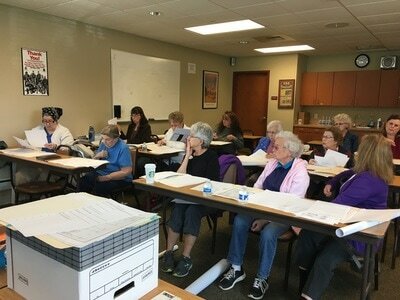 Using a real supplemental application as a guide, Colleen walked the group through the do's and don'ts of the process. 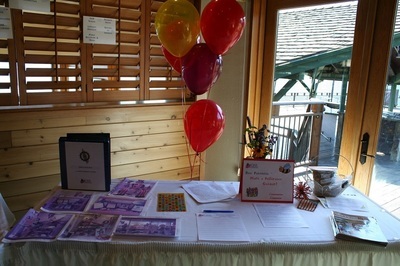 Those in attendance left with a bundle of handouts to use as a reference and refresher. ​Congratulations to Cadet Airman Danica Nichols, who is being recognized this year as the Lt. George Farragut Chapter DAR Outstanding Cadet. 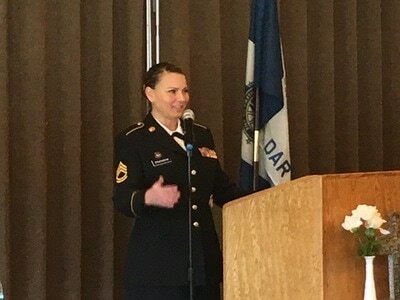 Cadet Nichols was congratulated for her commitment to the program, her outstanding work ethics, and her willingness to do whatever task needed to be done, whether large or small. 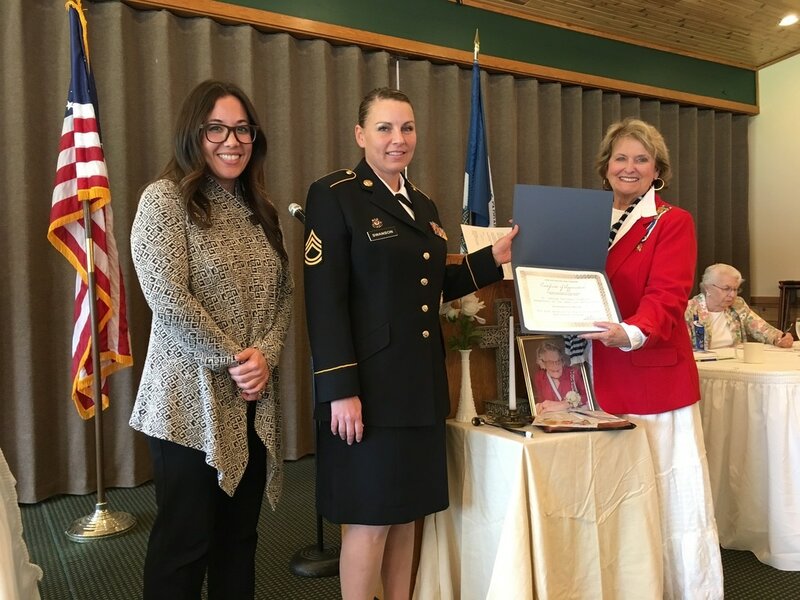 Cadet Nichols received a NSDAR Certificate signed by the President General Ann Turner Dillon and the Silver DAR Outstanding Cadet Medal. 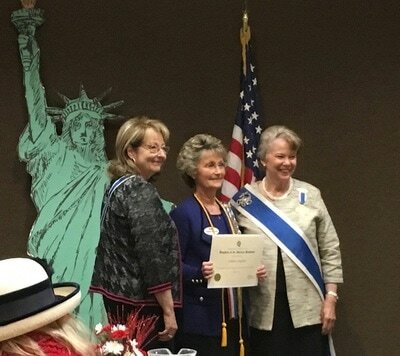 Presenting the award was chapter member Connie McGee. 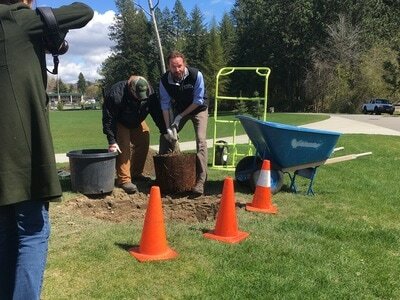 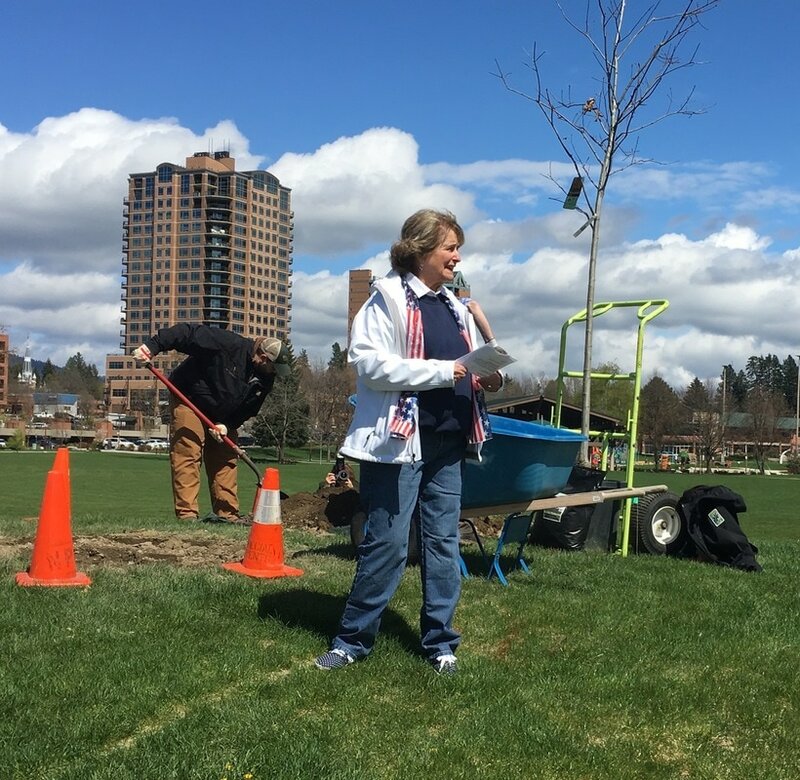 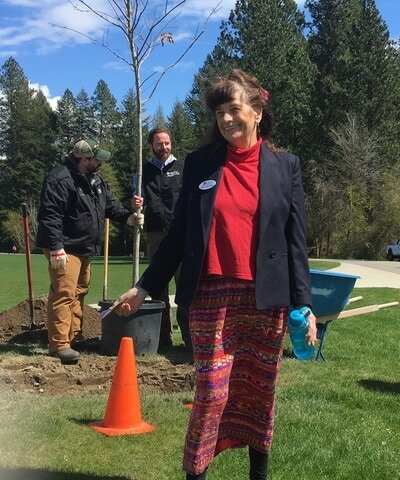 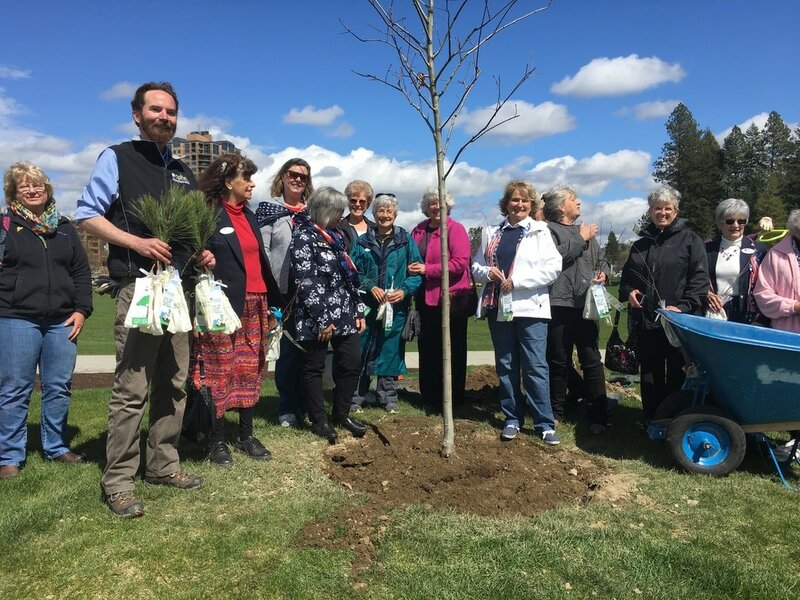 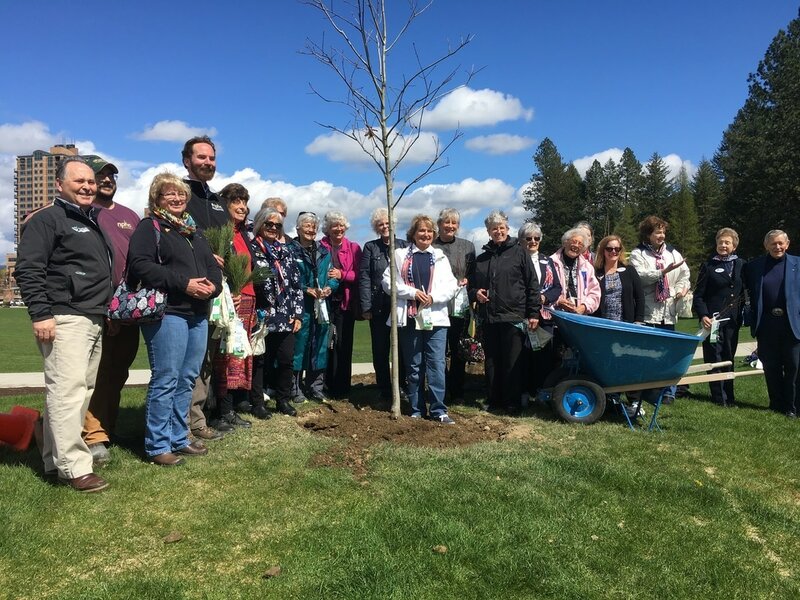 The sun was shining in all its glory when our group gathered at McEuen park for the planting of a red oak tree. 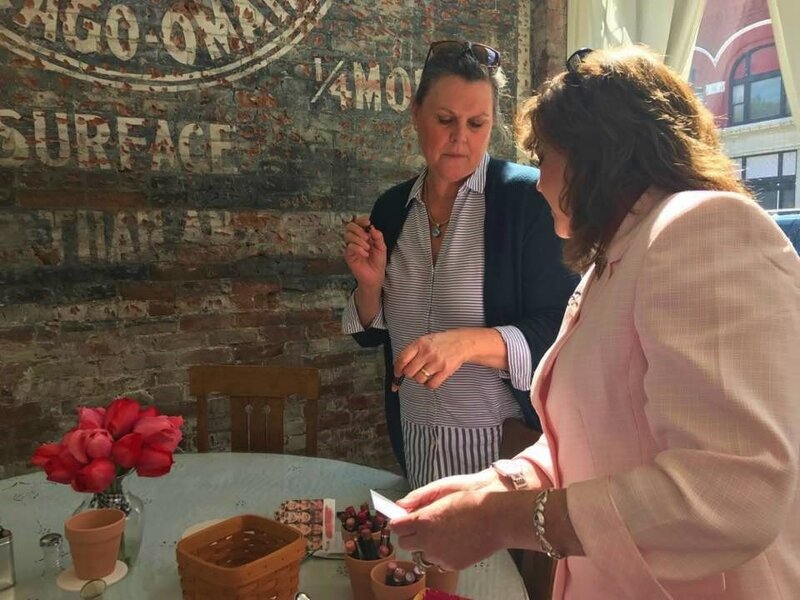 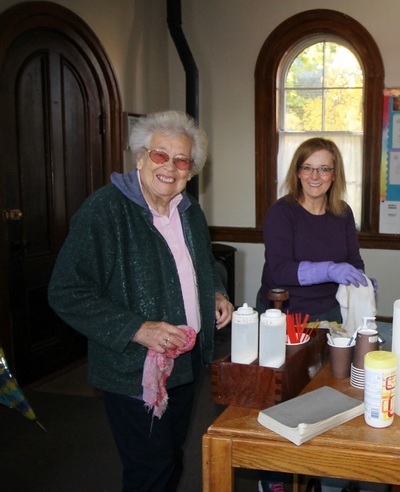 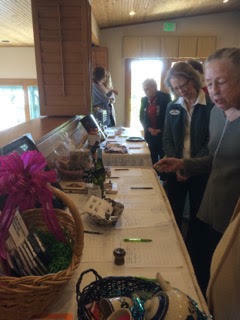 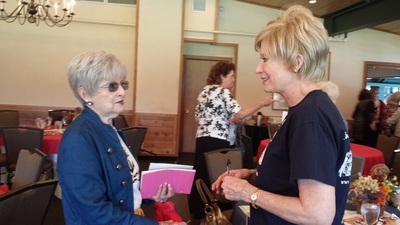 Conservation Chairman Jeanice C. (pictured left below) organized the event, securing donations from local businesses. 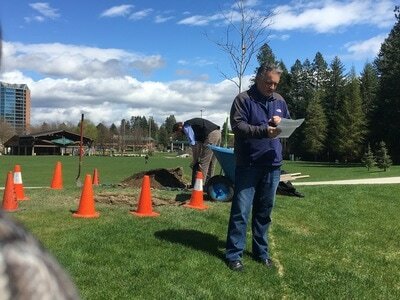 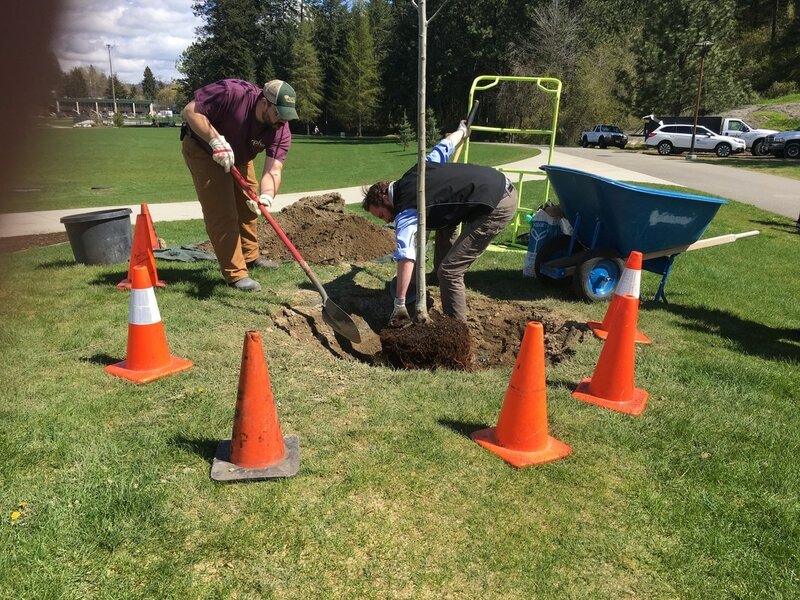 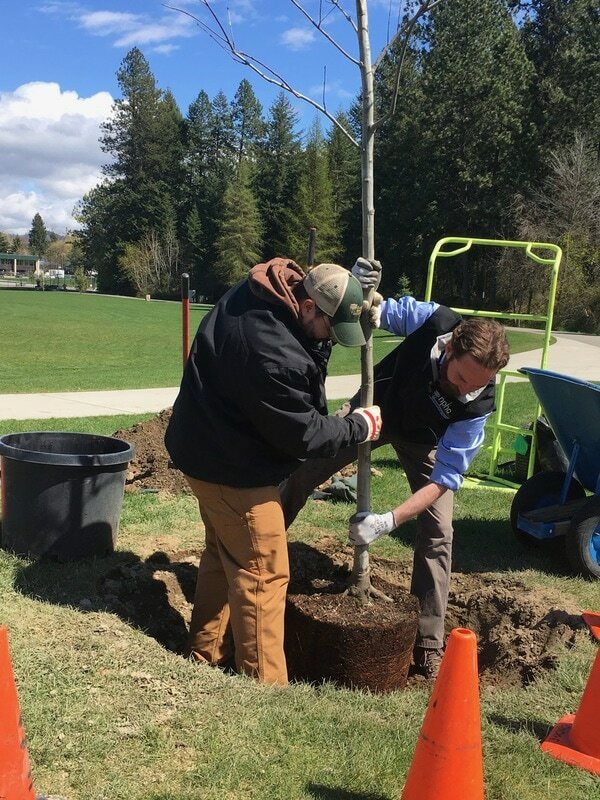 Bartlett Tree Experts in Spokane Valley donated the tree, prepared the spot and planted the tree. Walmart in Post Falls donated a gift card that was used to purchase flowers to attract bees and encourage pollination. 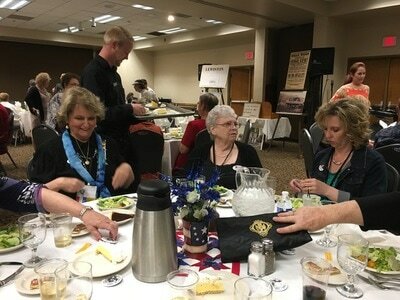 Coeur d'Alene Mayor Steve Widmyer (second from left) was an honored guest, and Regent Luella Stilley shared a few words. 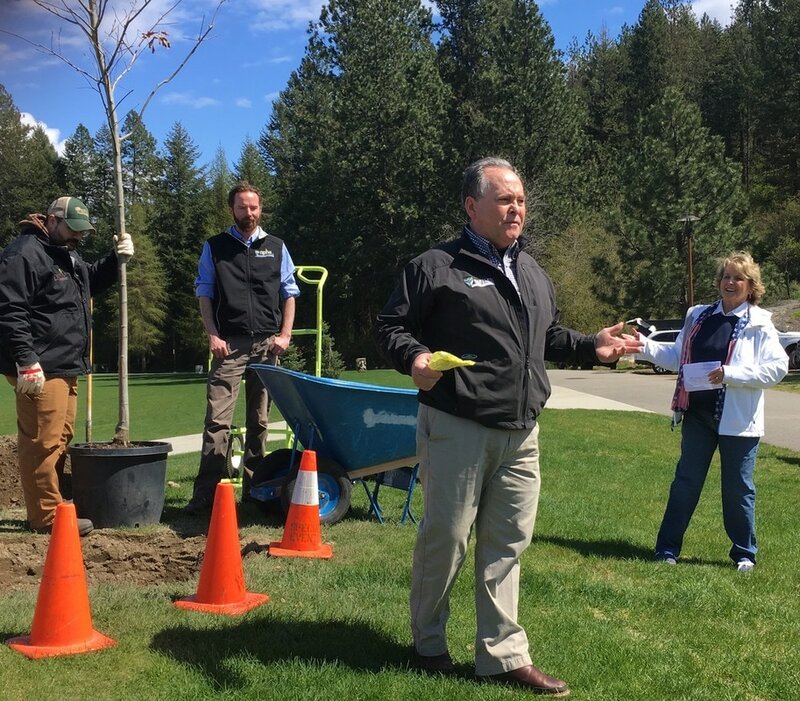 One gentleman from Bartlett shared how he previously worked maintaining the DAR grounds in Washington, D.C. Arborist Matt Voss (in vest) was in charge of the actual planting. A variety of saplings was available for those who attended. Flowers will be planted by the Parks & Rec staff at a later date. 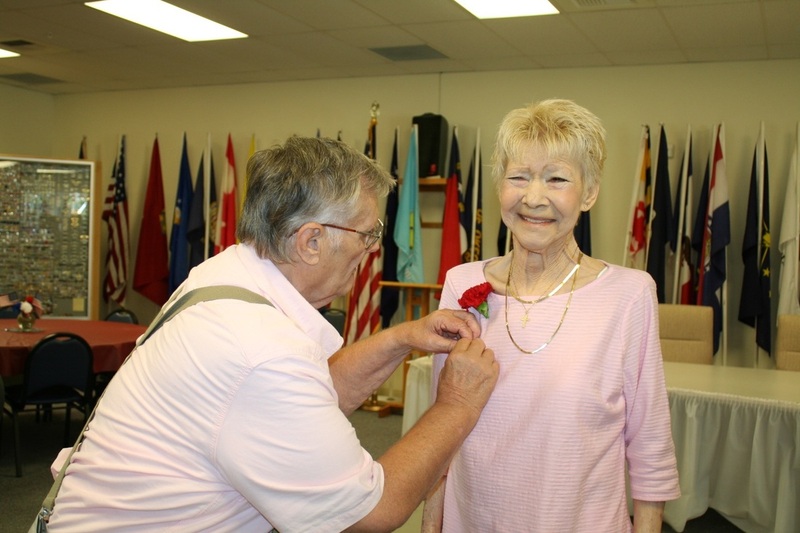 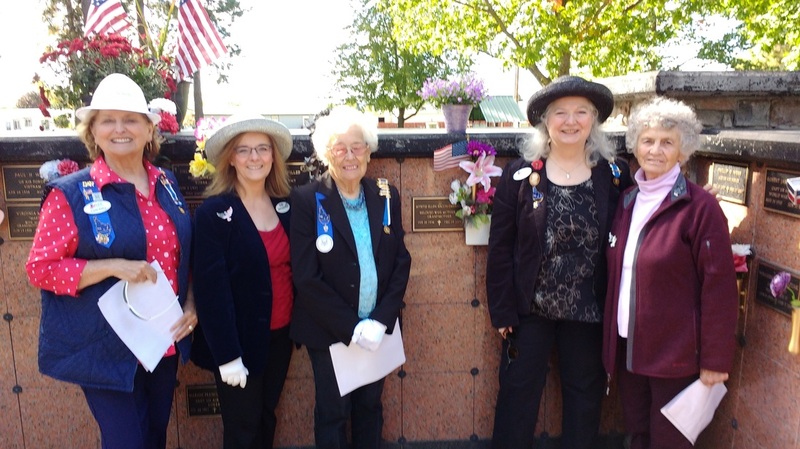 Today we remembered and honored chapter founding member Helen Naslund who passed away at the age of 100 on April 7th. 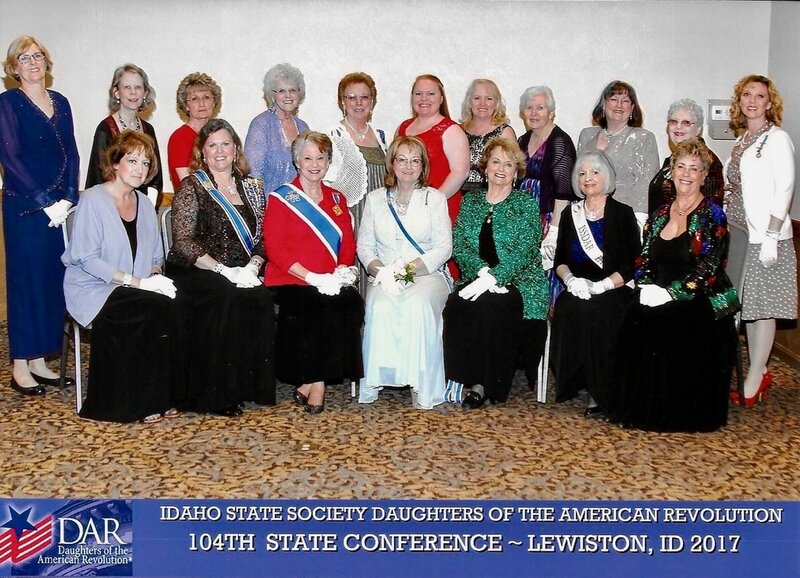 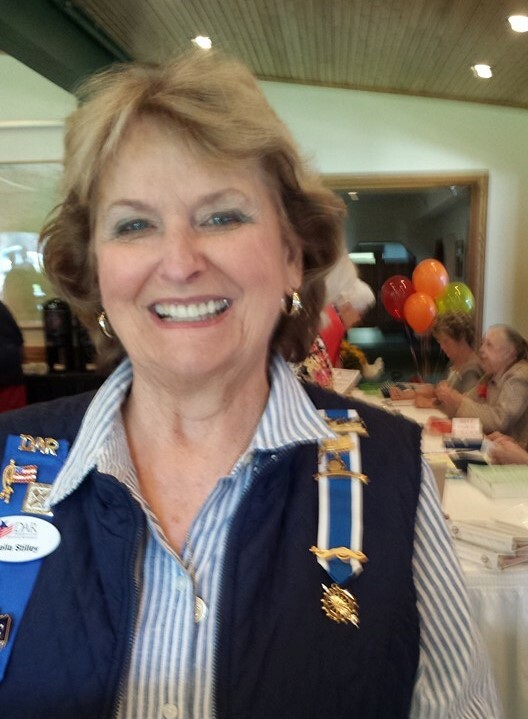 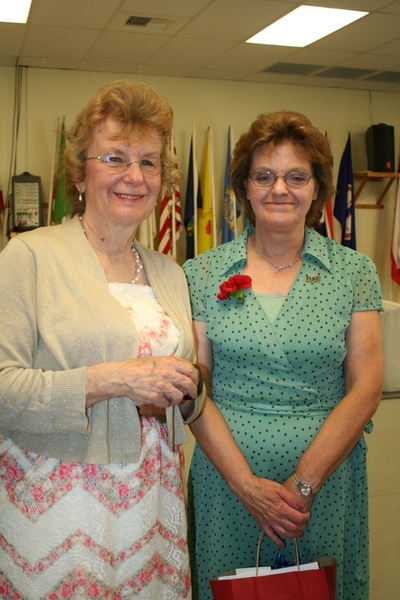 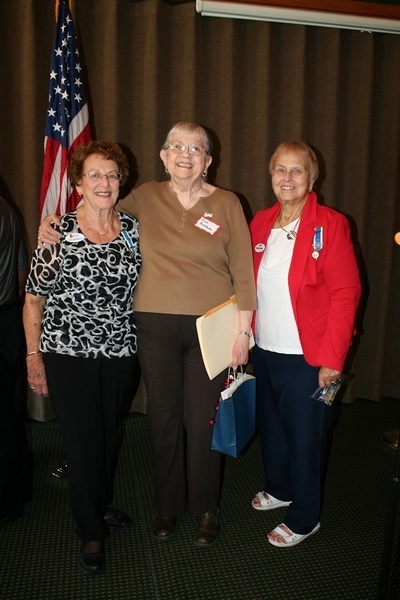 Helen served our chapter and the state society in so many ways during her 50+ year DAR membership. 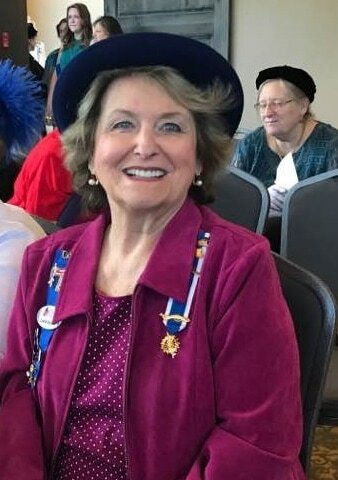 She was our first chapter secretary and our second chapter regent, serving as regent from 1967-1969. 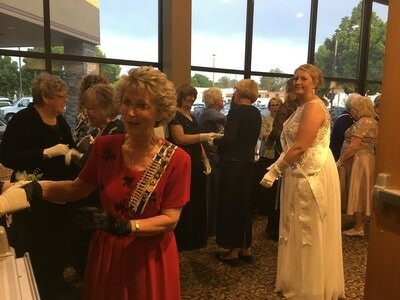 Helen served as regent of our state society from 1977-1979. 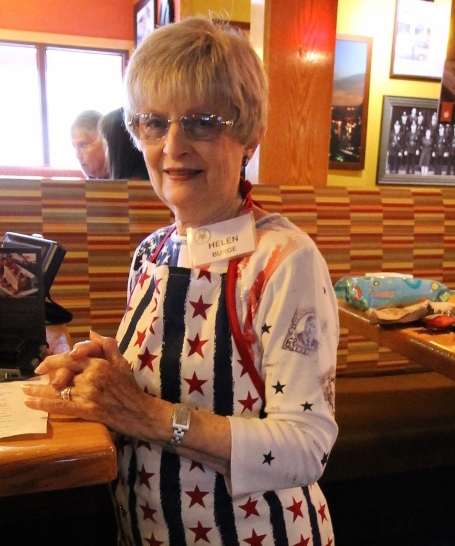 She served on multiple committees and was an officer for many years. She will be dearly missed. 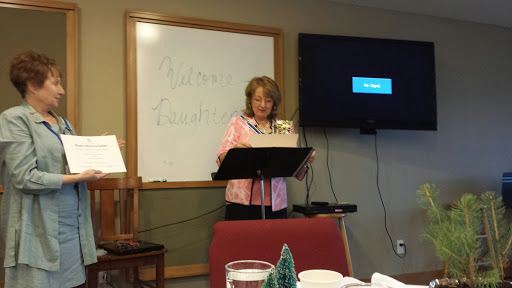 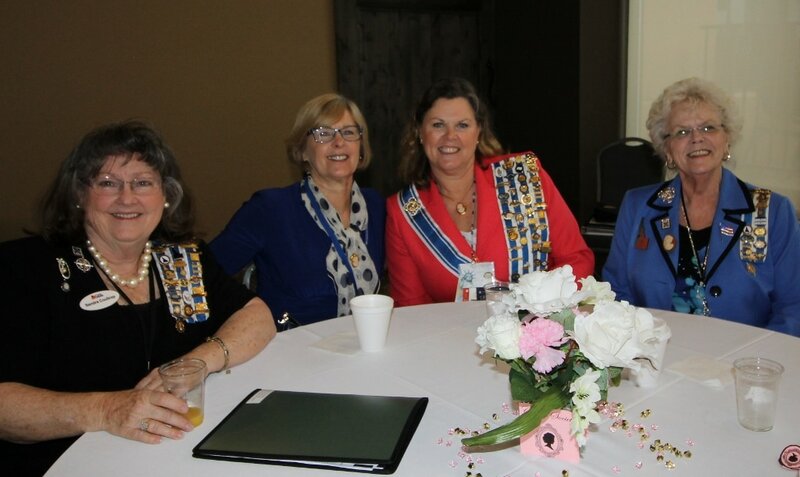 Beth P. was welcomed as a new member. 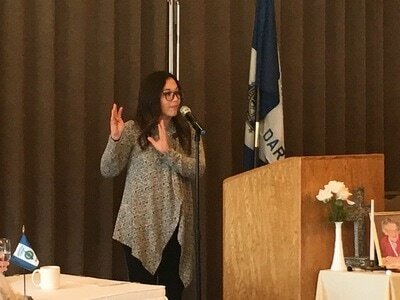 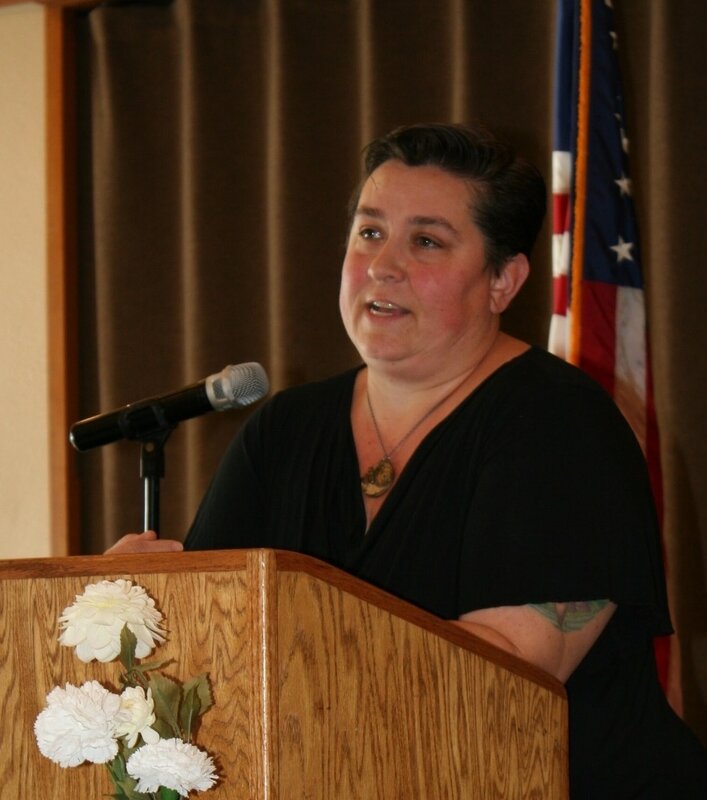 For our program Dannie Swanson shared her experience serving with the Idaho National Guard before Cassandra Rzepa talked about her role with the Family Assistance Center. 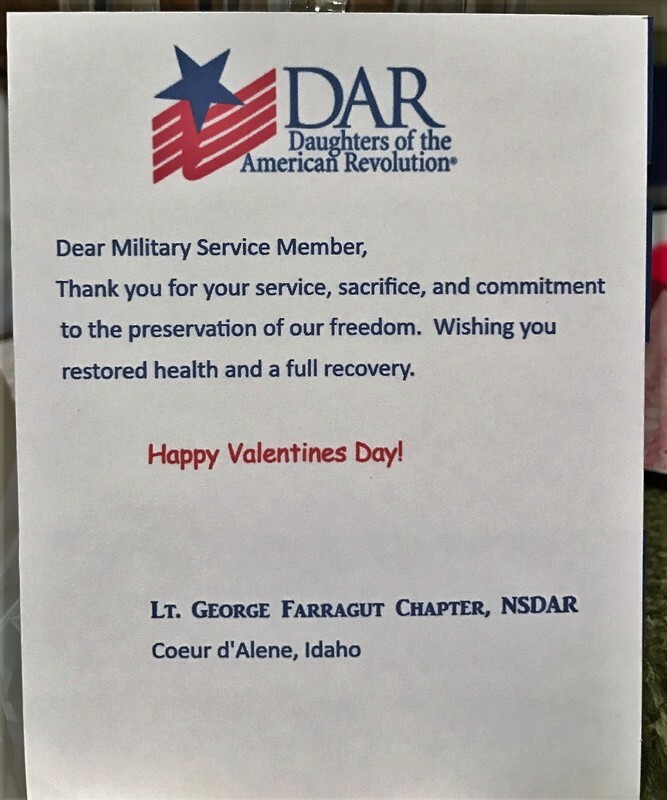 Our chapter was presented a certificate of appreciation for our Christmas donation to help provide gifts for National Guard families. Daughters were generous in bringing hero biographies and silent auction items to support Connie M's capstone project. 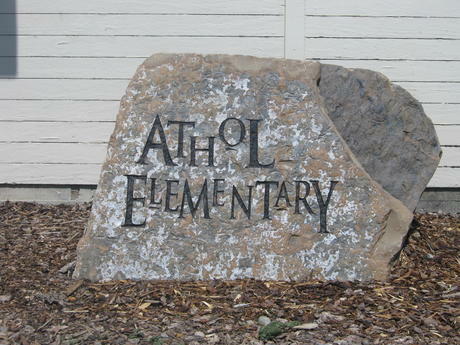 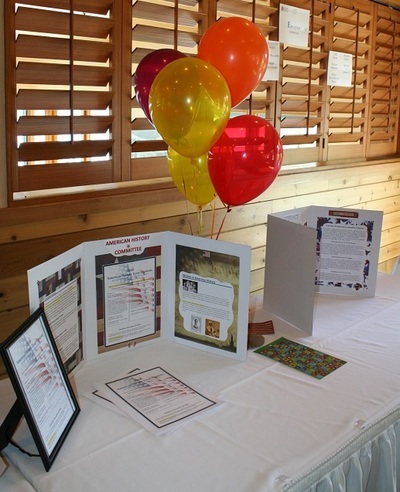 The books and $571.50 raised at the auction will benefit Athol Elementary School. 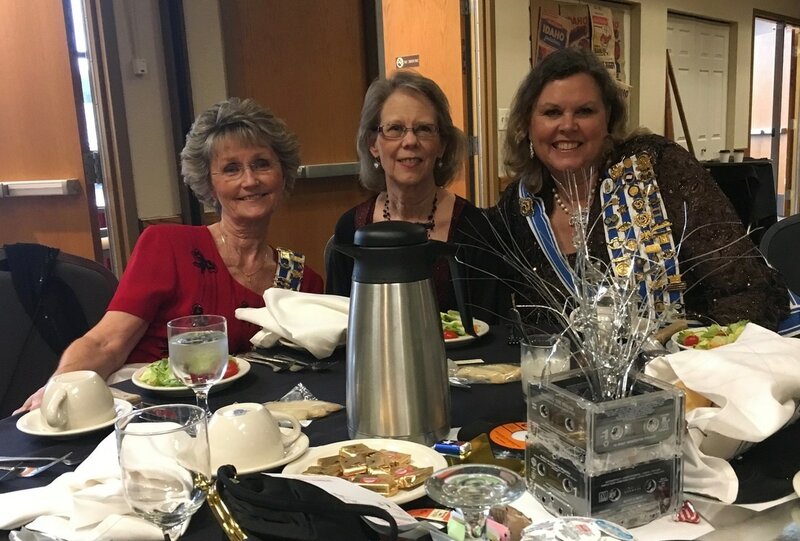 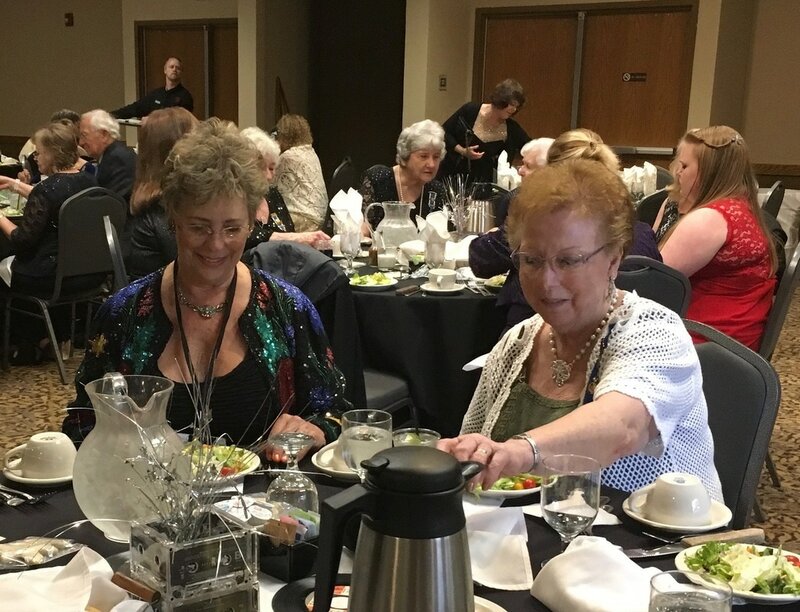 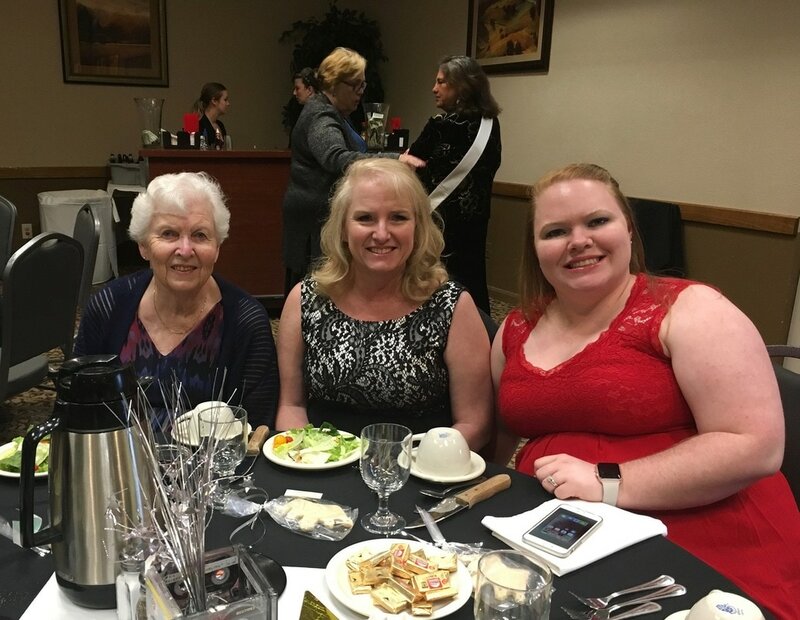 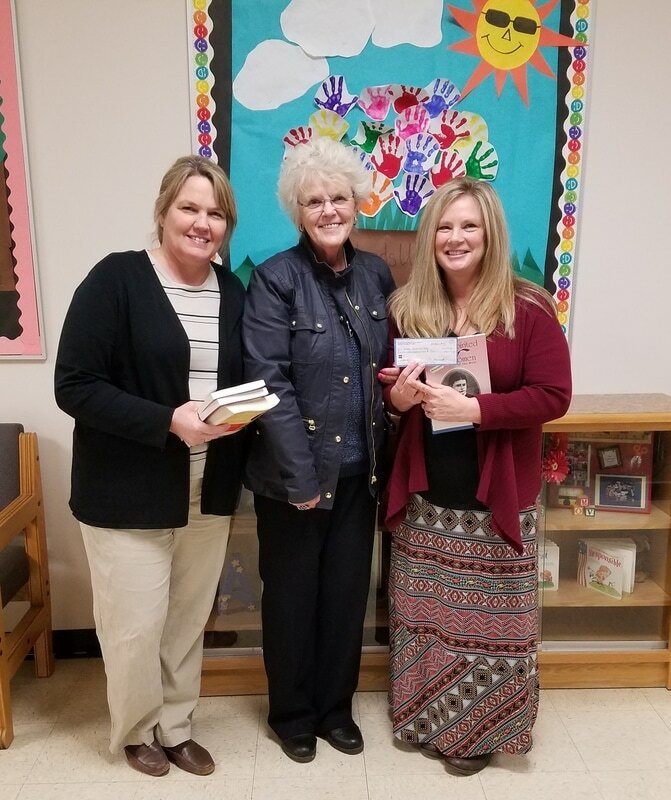 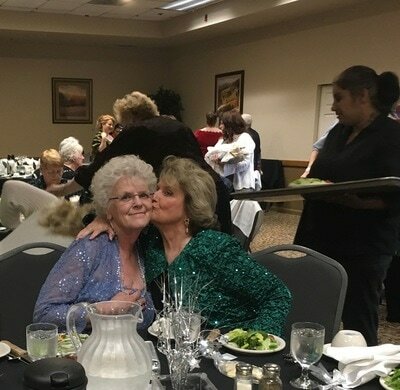 Picture below are some of our silent auction tables and Connie with Athol Elementary Principal Kathy Thomas and Athol Elementary Librarian Connie Berger. 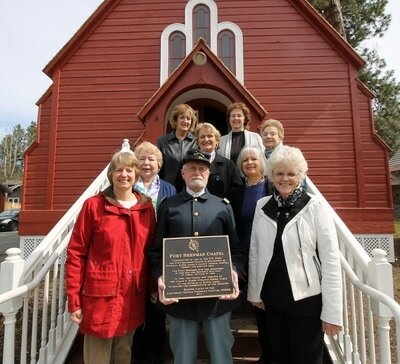 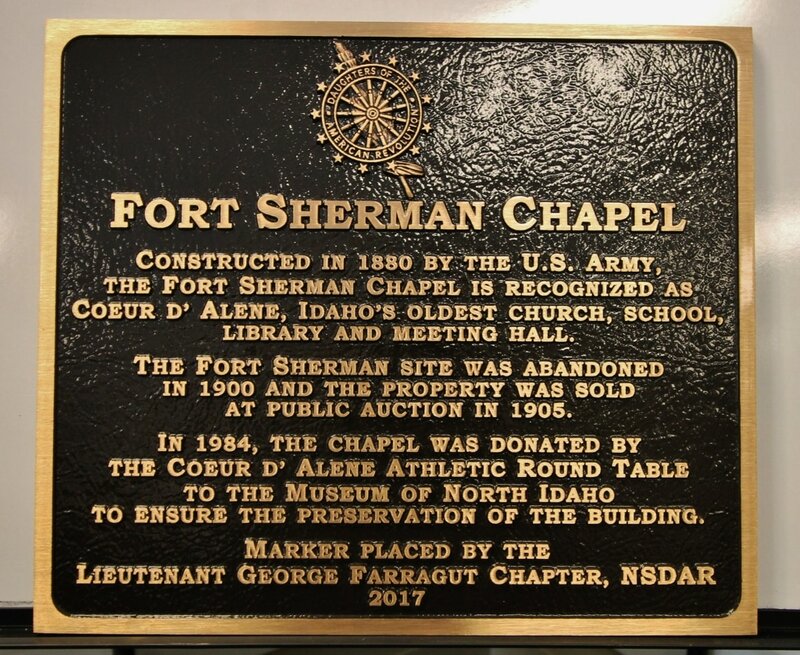 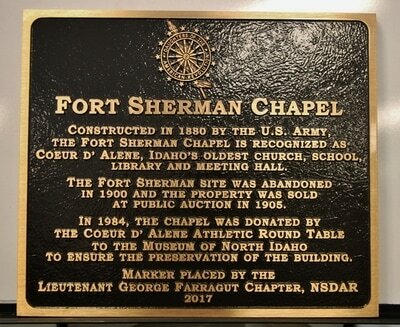 On a chilly but beautiful spring day, Lt. George Farragut chapter members joined historian Bob Singletary and Dorothy Dahlgren, director of the North Idaho Museum, to dedicate a historical marker for the Fort Sherman Chapel. 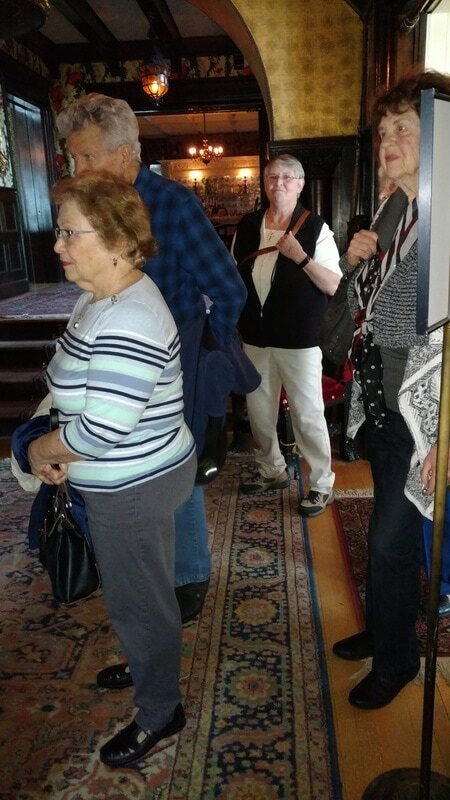 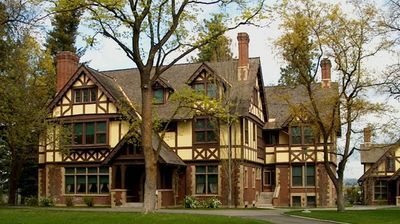 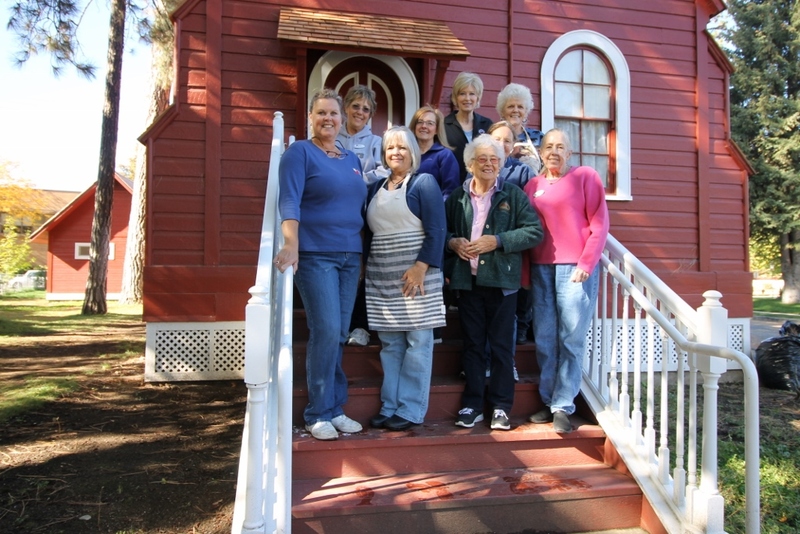 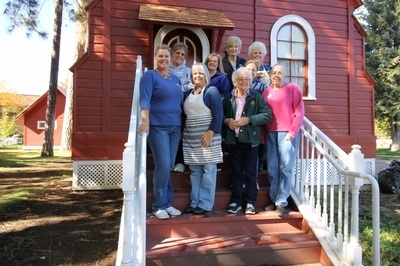 As a joint effort of our Conservation and Historic Preservation committees, members of Lt. George Farragut Chapter enjoyed a tour of the Campbell House and The Northwest Museum of Arts and Culture in Spokane. Ed Santos from Center Target Sports captured our attention as he shared a program on Self Defense for Women. 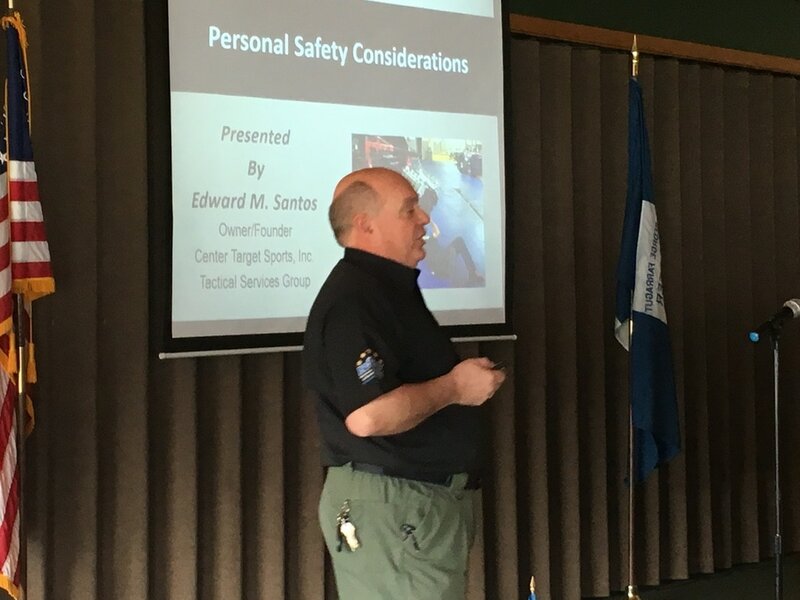 Many were surprised to learn that 90% of violent crimes are key-related, meaning they happen when the victim is going to or from his or her car or home. 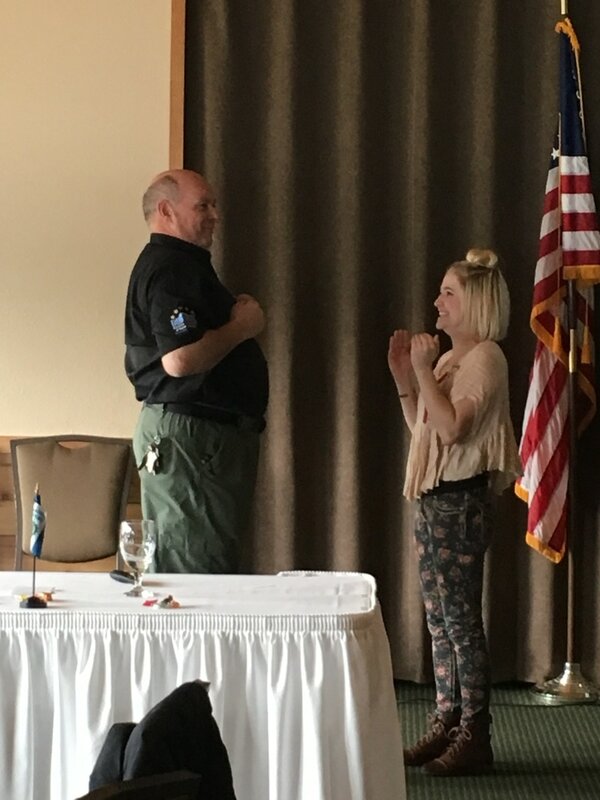 Prospective member Rayla assisted Mr. Santos with a demonstration on the importance of maintaining distance between yourself and a potential attacker. 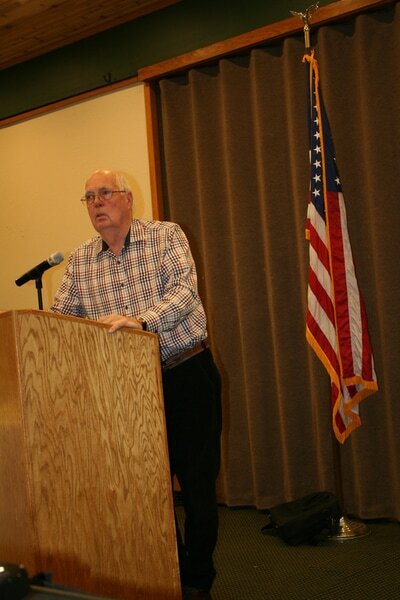 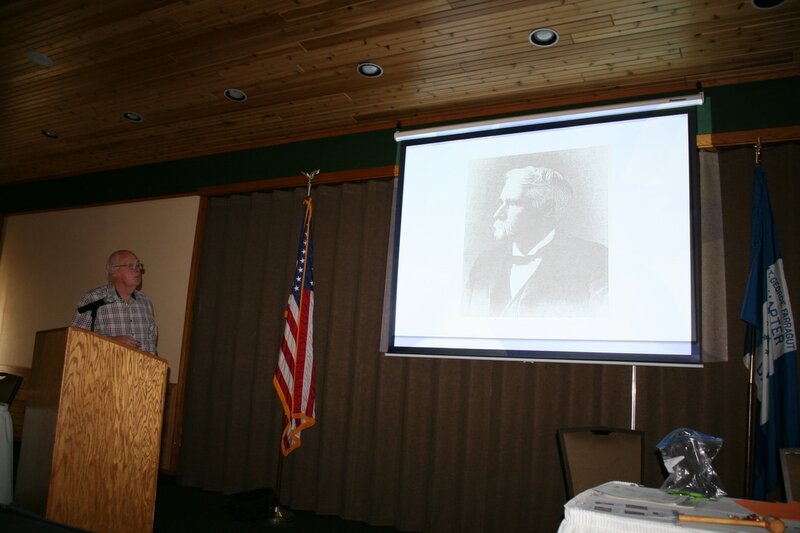 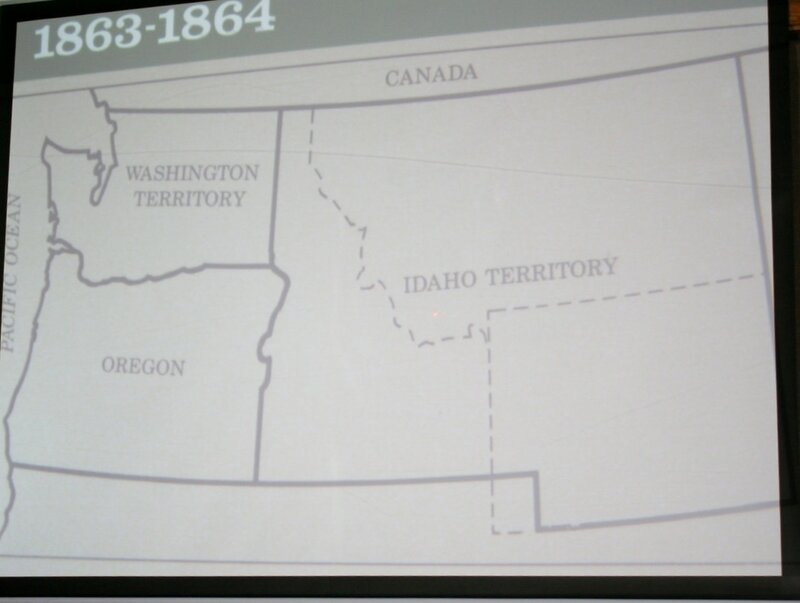 Historian Don Pischner presented a program on How Idaho Got Its Shape, covering territories between the 1850s and 1860s. 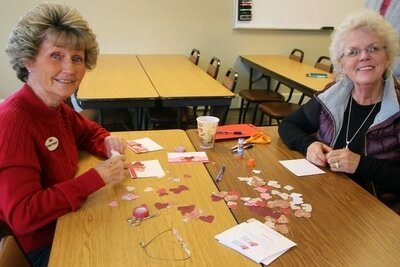 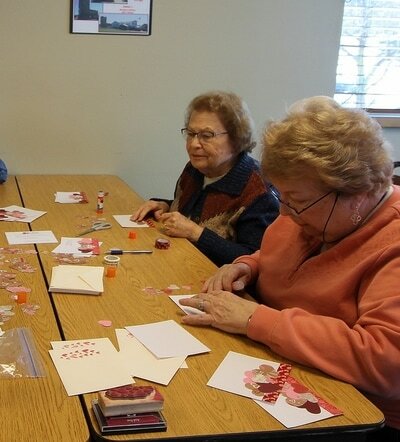 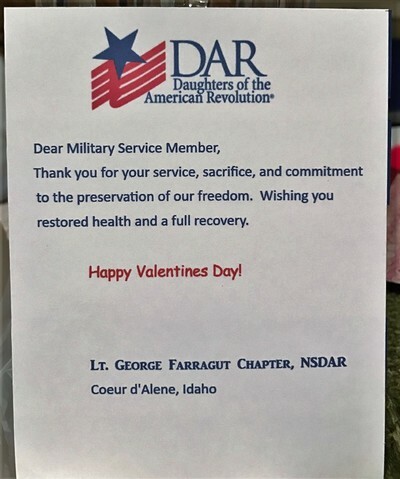 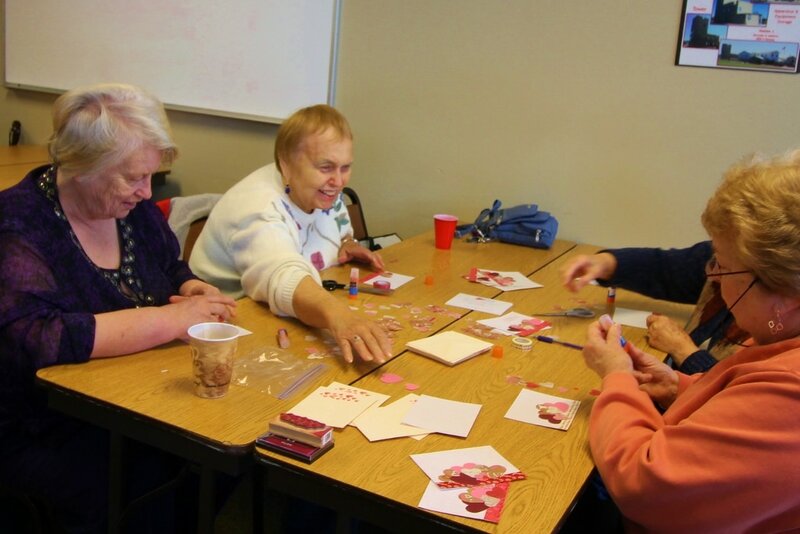 Lt. George Farragut chapter members and friends made 50 Valentines for the VA hospital in Spokane and 50 Valentines for the military hospital in Landstuhl, Germany. 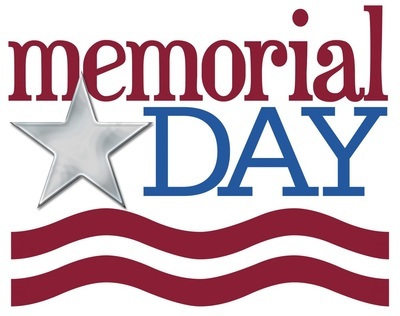 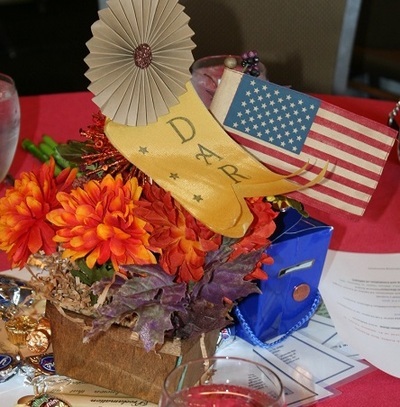 We love our veterans! 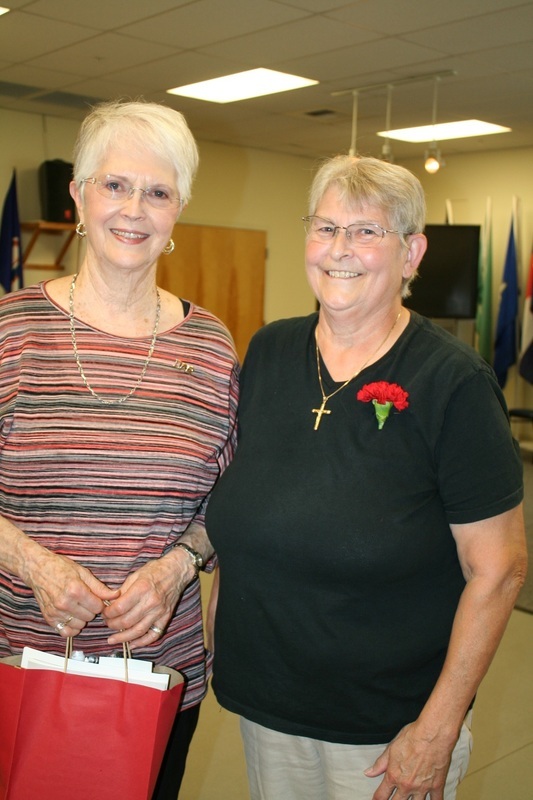 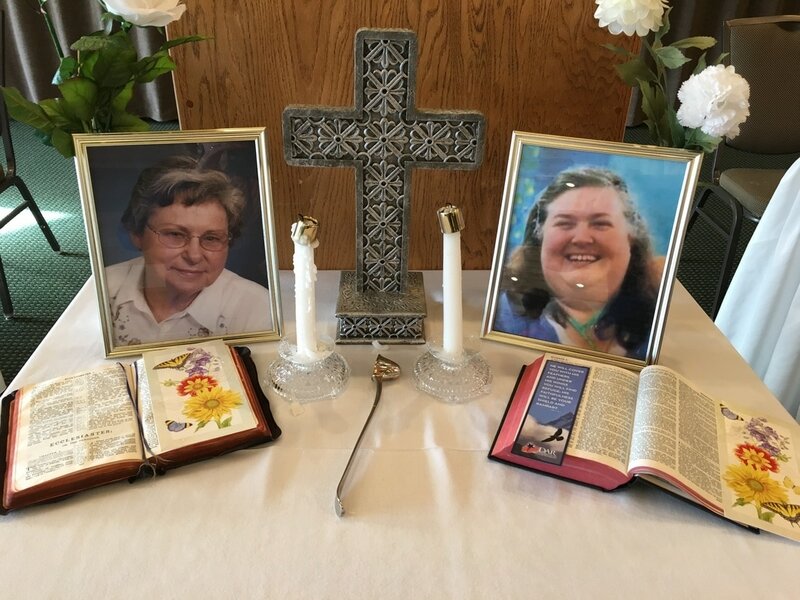 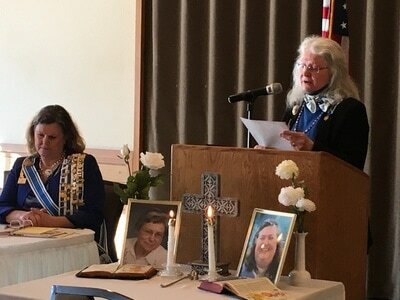 The mood was somber as Chaplain Cindy Schobert led a memorial service for two departed Daughters, Jennifer Henage and Betty Schmehl. For our program, Charlotte Pegoraro of Peony Bee Apiary shared educational information on bees and how important they are for plant pollination. 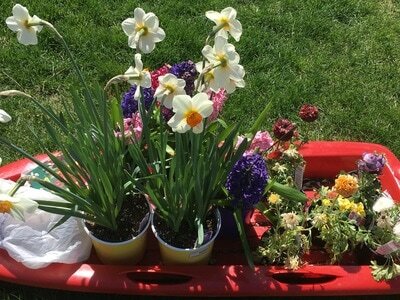 Charlotte added a page to her website with lists of plants that are helpful to the bee population. 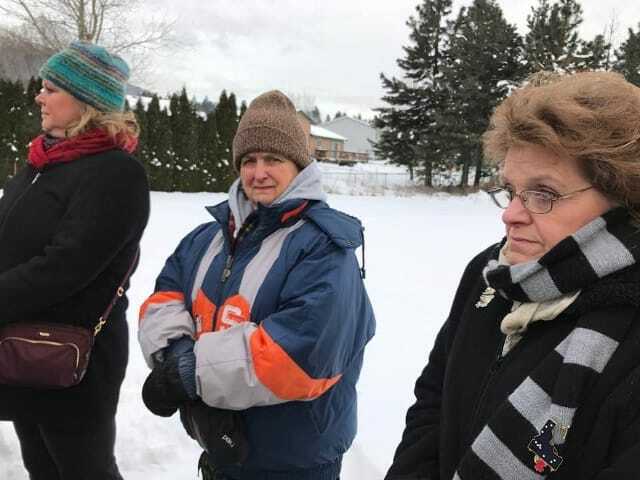 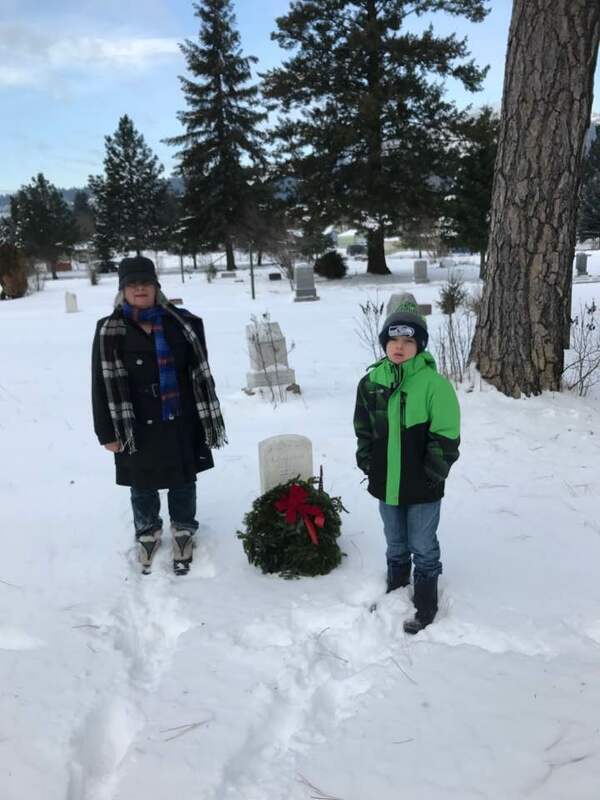 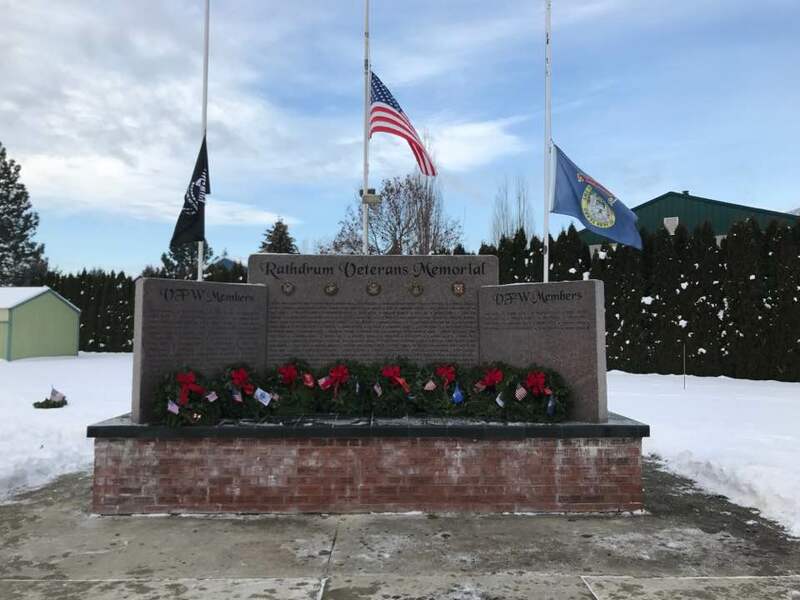 The weather outside was frightful, but that didn't stop a few of our DAR ladies from gathering at Pinegrove Cemetery in Rathdrum for the annual Wreaths Across America program. 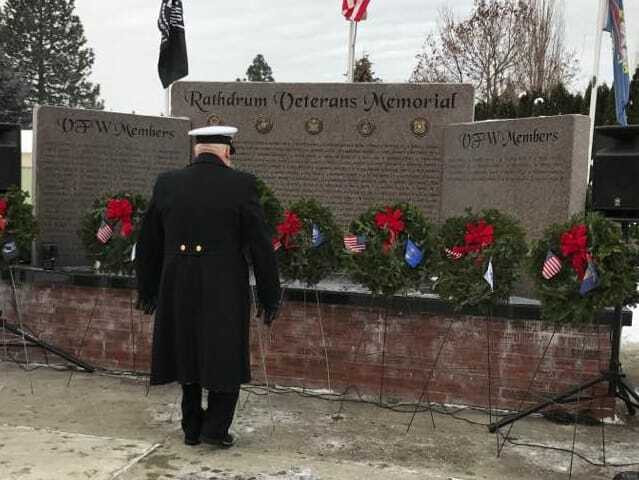 Over 100 wreaths were laid on the graves of veterans; some of those wreaths were purchased by our chapter. 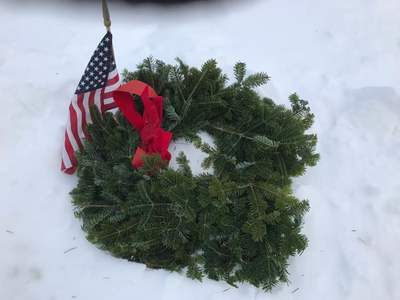 The mission of Wreaths Across America "Remember, Honor and Teach is carried out by coordinating wreath-laying ceremonies at Arlington National Cemetery, as well as over 1,100 additional locations in all 50 U.S. states, at sea, and abroad. The holiday spirit was everywhere at our December meeting, from the beautiful table decorations to the festive attire of those attending. 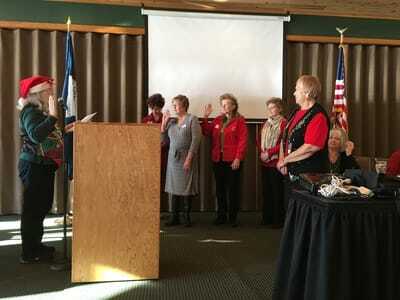 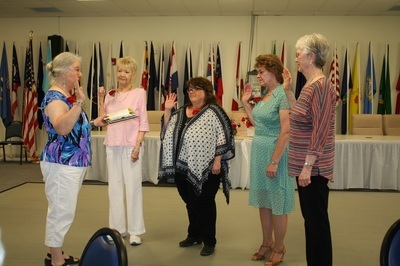 Two new members, Kathy S. and Cheryl B. took the oath of membership before chapter member Liz Jones presented a program on Christmas rooms at the DAR Museum in Washington, D.C. Members and guests also contributed books for Books for Tots and canned food and other items for the Rathdrum Food Bank. 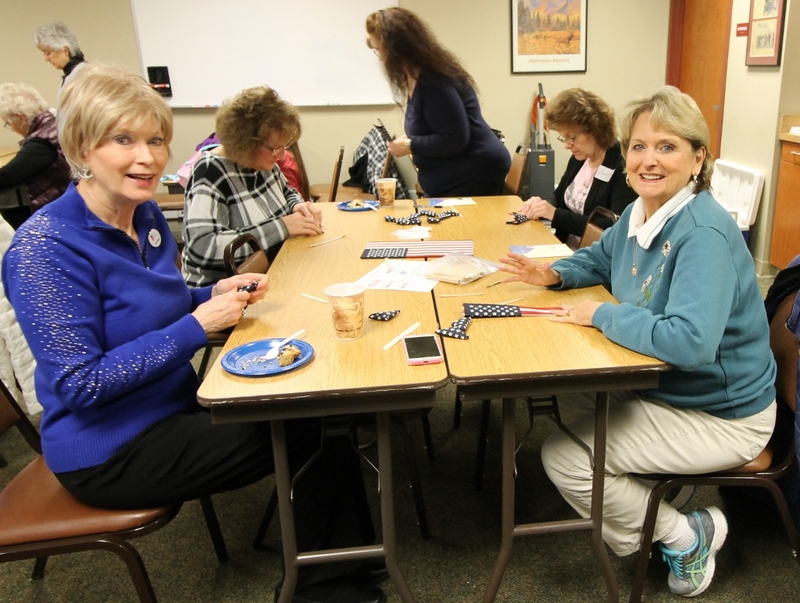 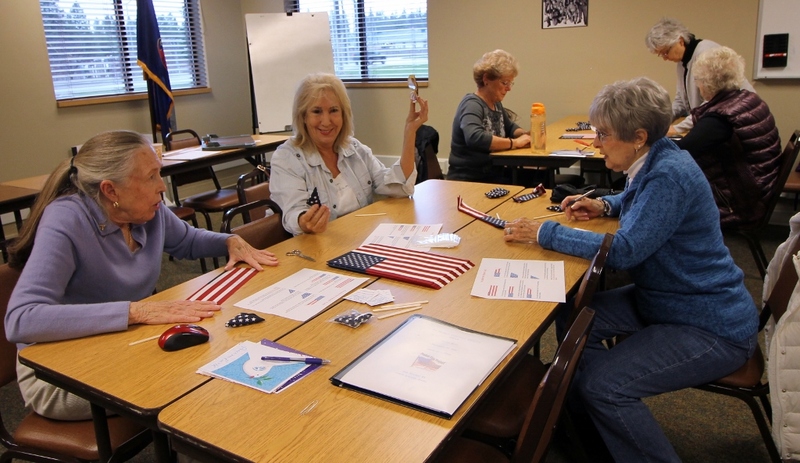 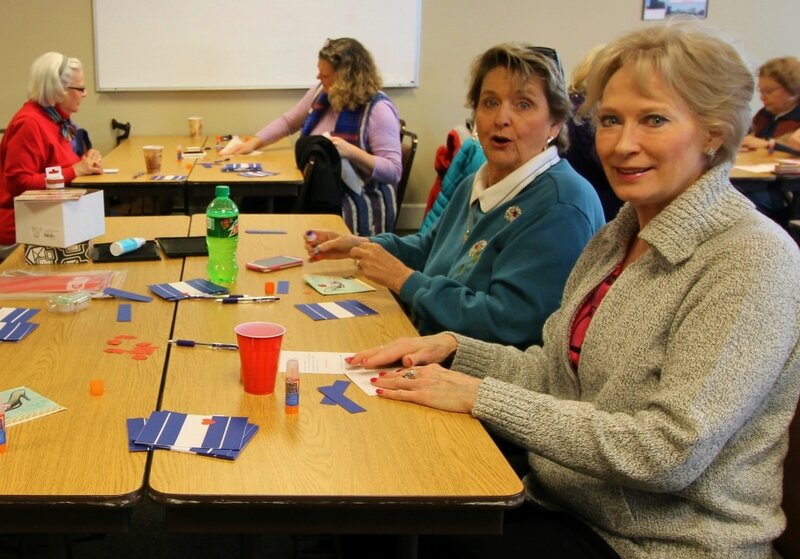 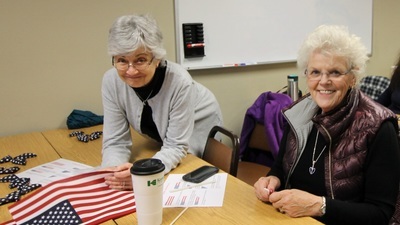 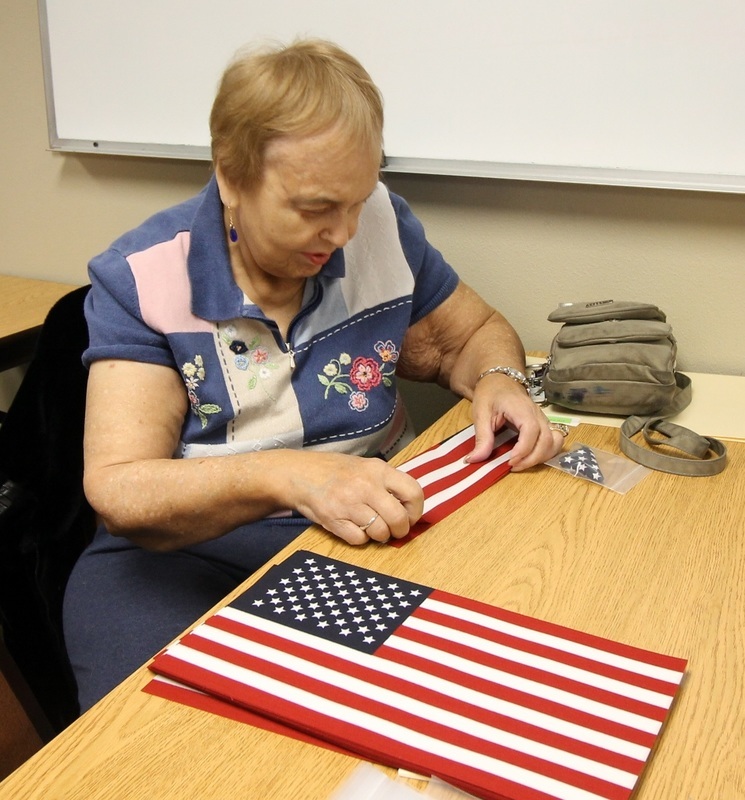 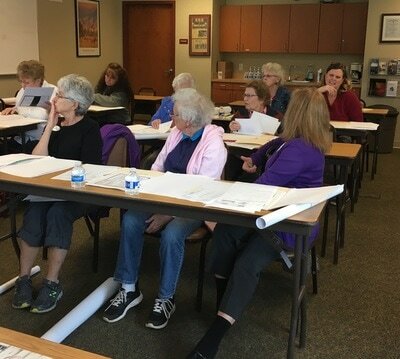 Nearly 20 chapter members and a prospective member gathered on a Saturday morning to make pocket flags for National Guard and Fairchild Air Force Base troops from Idaho and Eastern Washington. 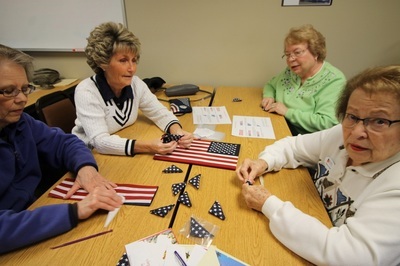 This is part of Project Pocket Flag, a project began in 2001whose goal is to "get as many pocket flags as we can into the pockets of our military personnel . 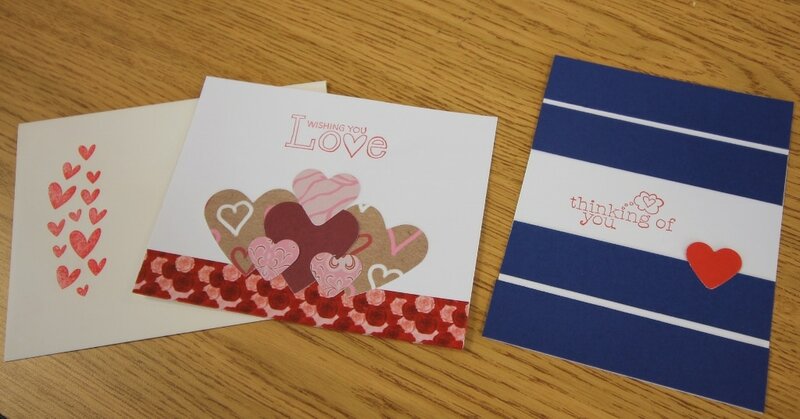 . . to let them know we care." 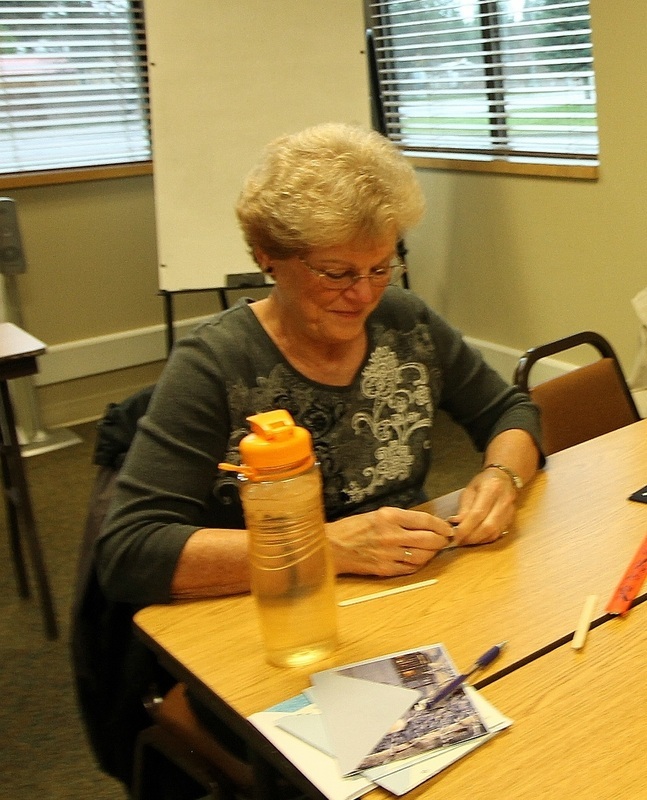 Our fine motor skills were put to the test, but we persevered for the good cause. 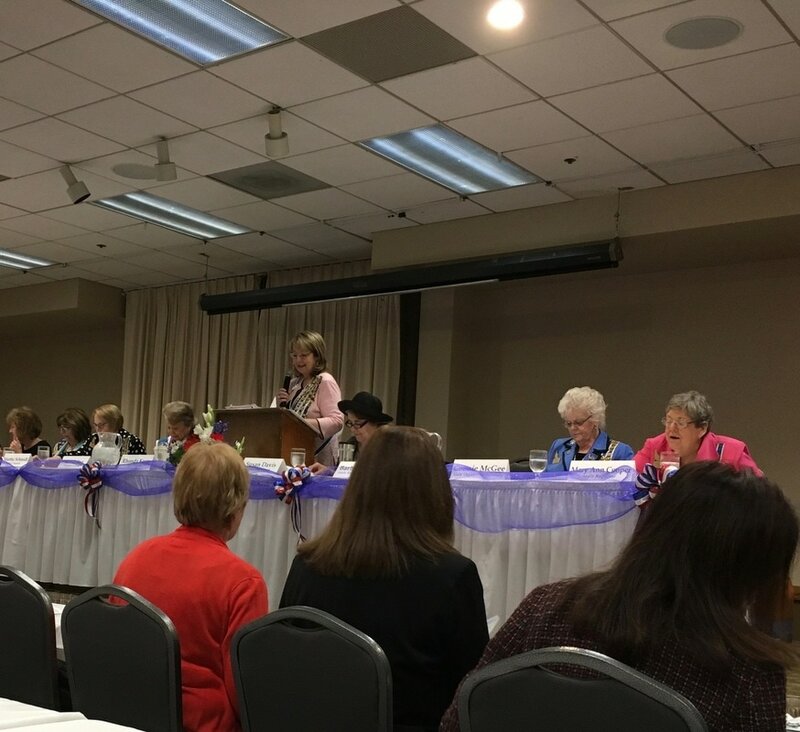 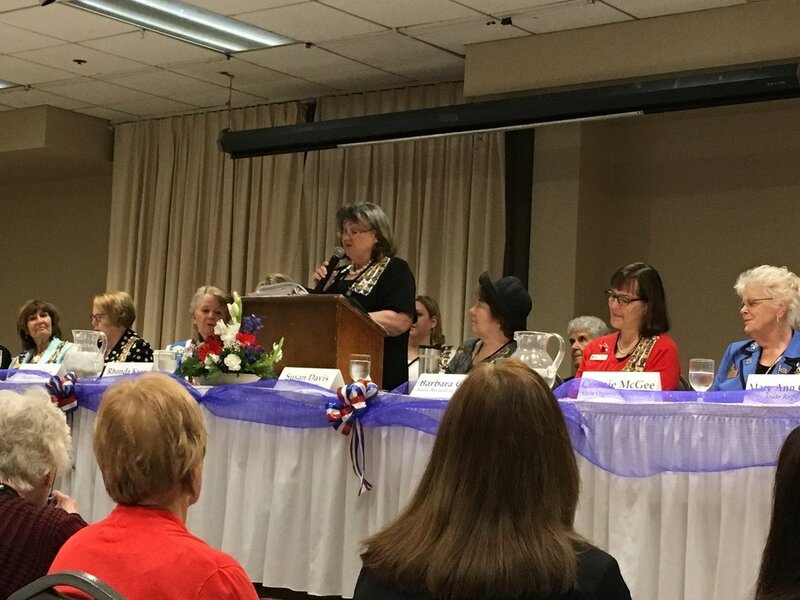 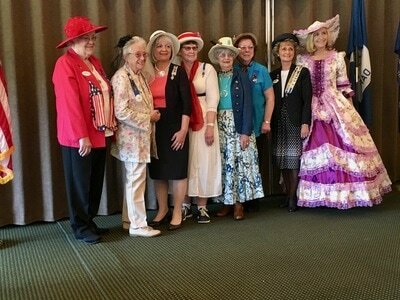 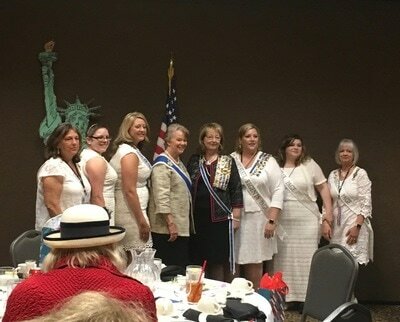 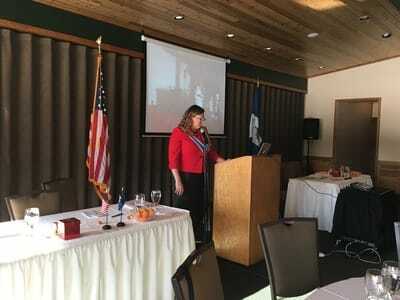 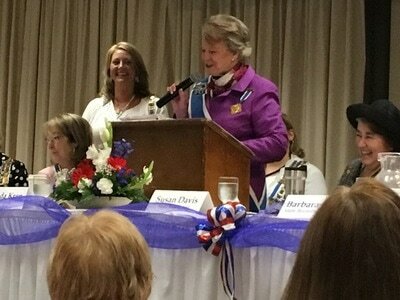 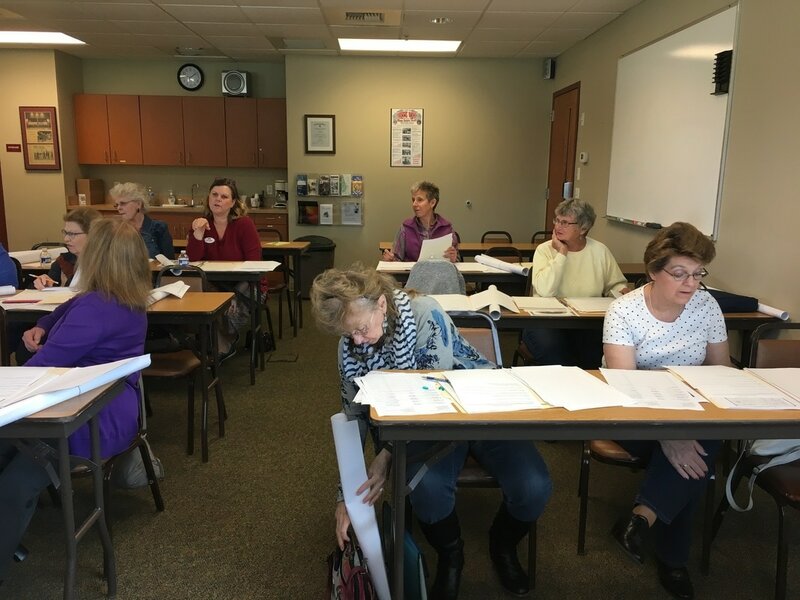 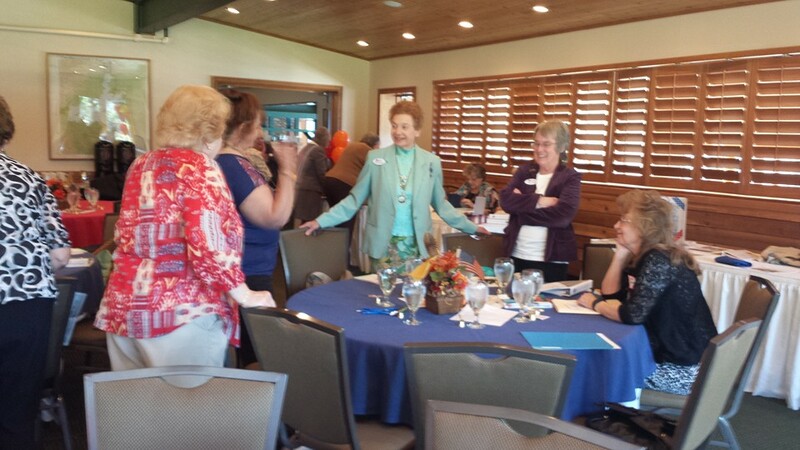 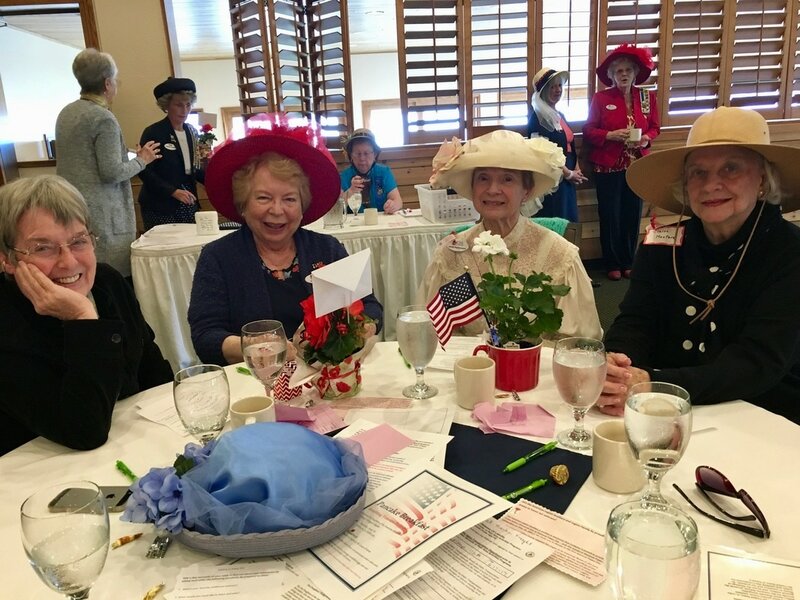 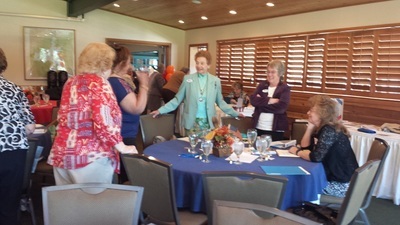 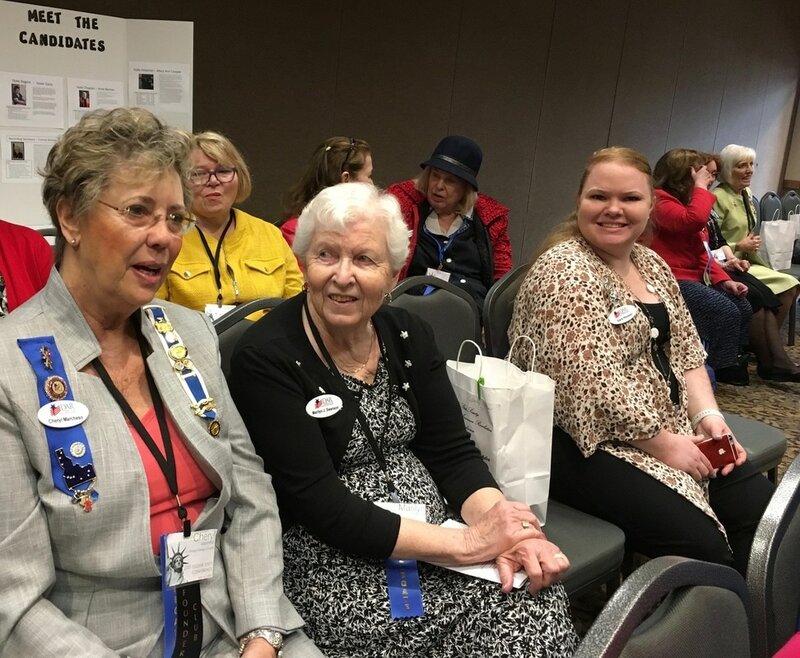 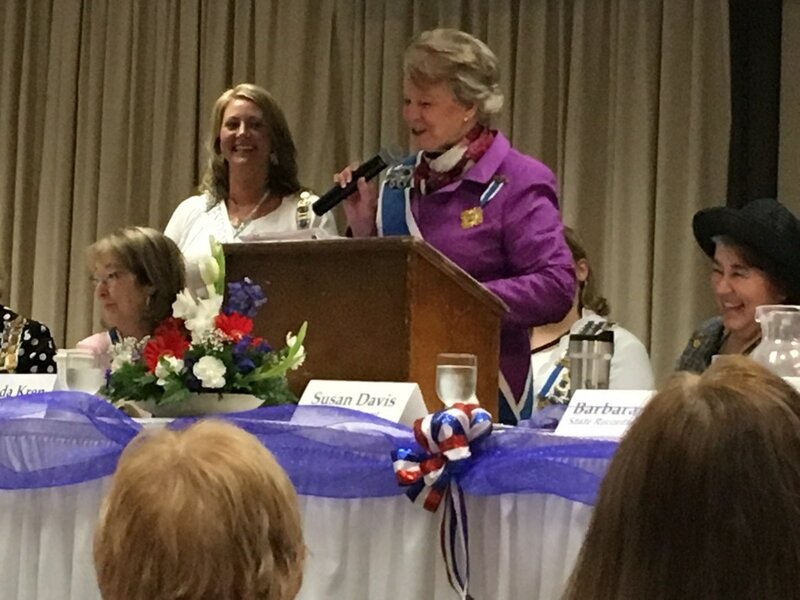 Lt. George Farragut Chapter ladies ventured north to join Wild Horse Trail Chapter for a joint meeting with State Regent Rhonda Kren. Rhonda shared her vision for the Whitebark Pine restoration project. 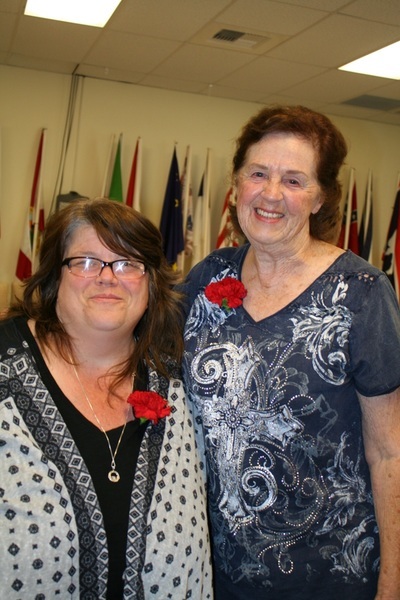 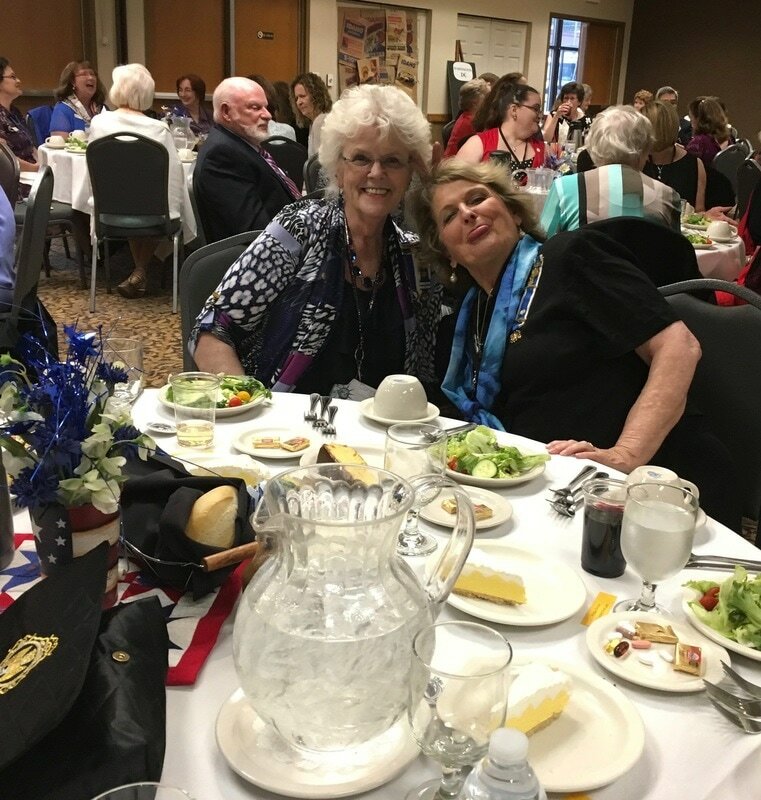 Pictured is Wild Horse Trail Chapter Regent Susan Lamb with State Regent Rhonda Kren. 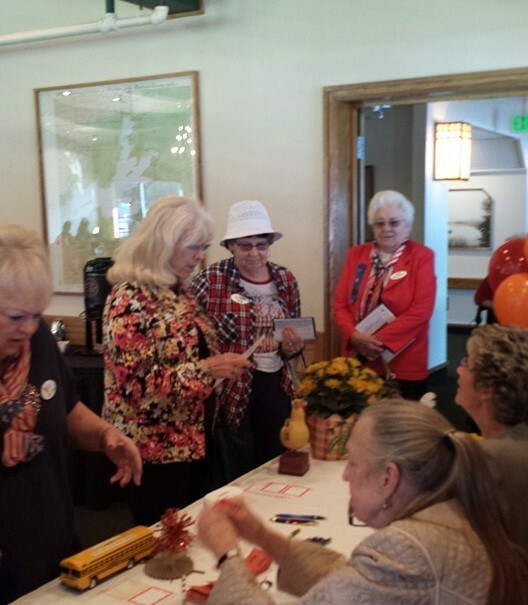 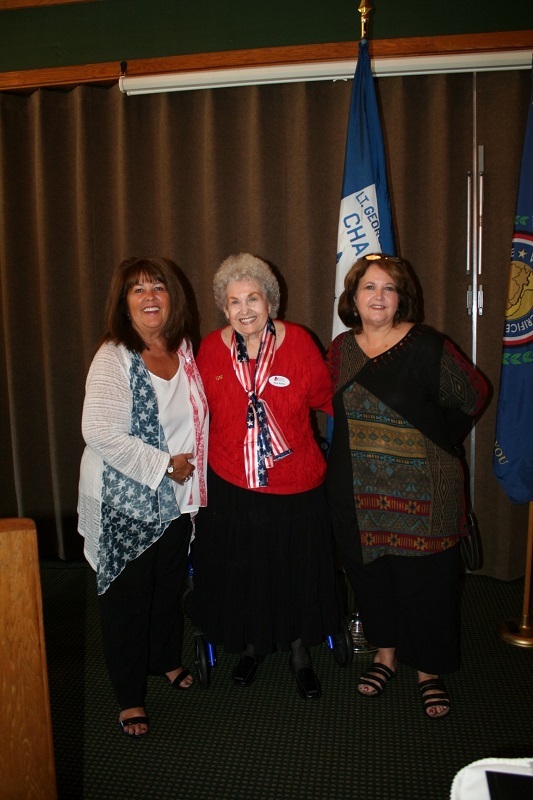 Our October meeting featured a Heritage History Fashion Show presented by the talented Lorri Williams. Lorri made each of the outfits featured in the program. Models were our own chapter members as well as friends and family of Lorri. 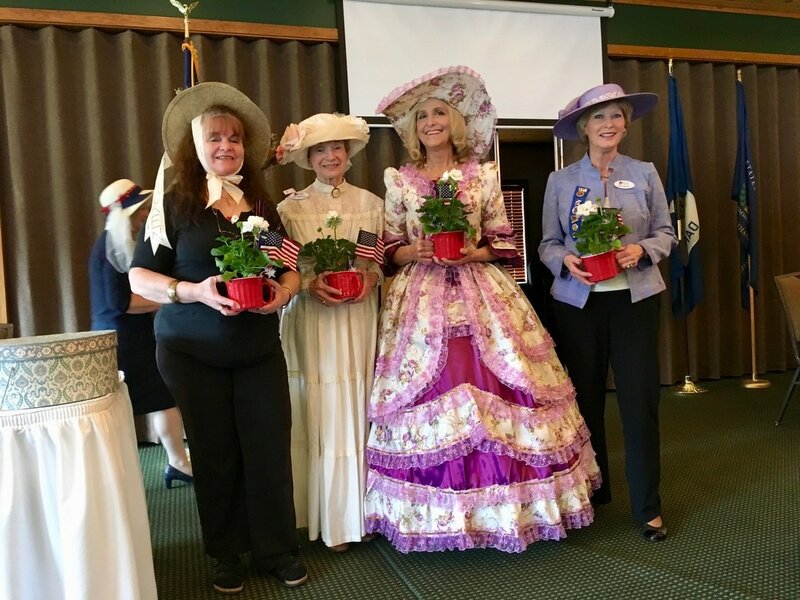 As each model was featured, the story behind the historical figure being represented was told. 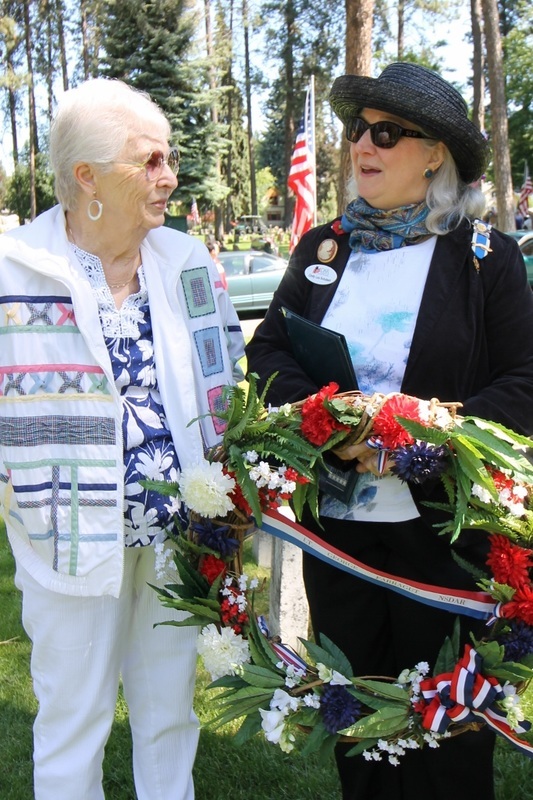 Photos courtesy of Terry Zylawy. 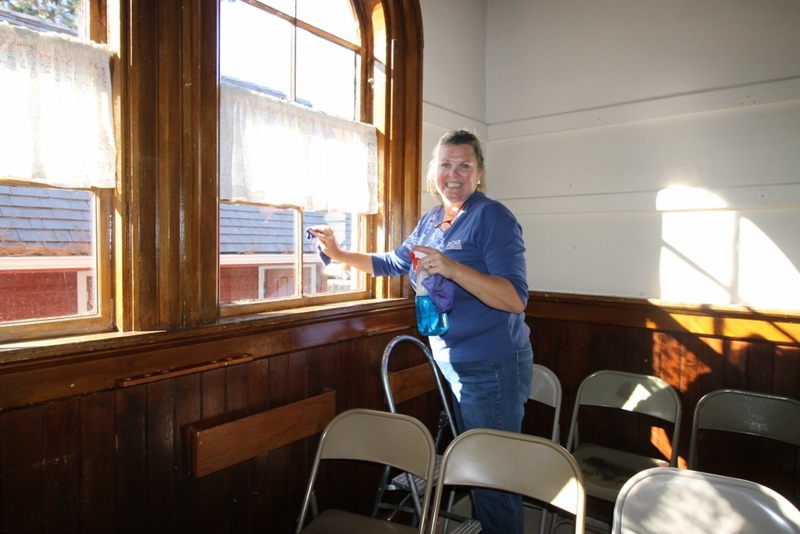 Joining DAR chapters across the nation for DAR's National Day of Service commemorating the founding of DAR on October 11, 1890, our chapter chose to clean the historic Ft. Sherman Chapel. 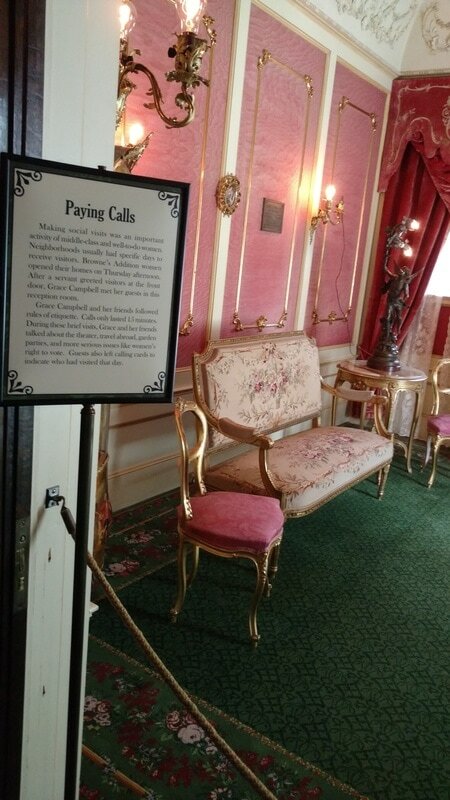 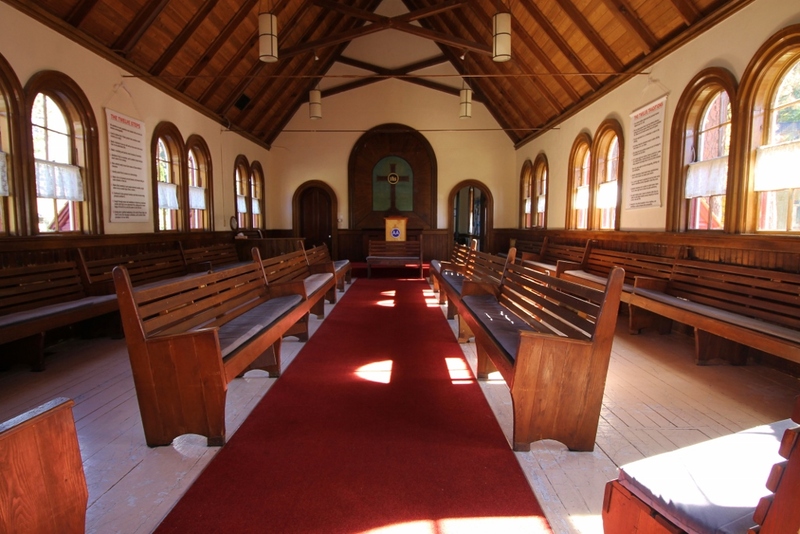 (Read more about the chapel here.) Eight chapter members pitched in, cleaning windows, removing cobwebs and cleaning dust boards. The wood floors were swept and damp mopped; the carpets were vacuumed. Pews and folding chairs were dusted and cushions wiped down. 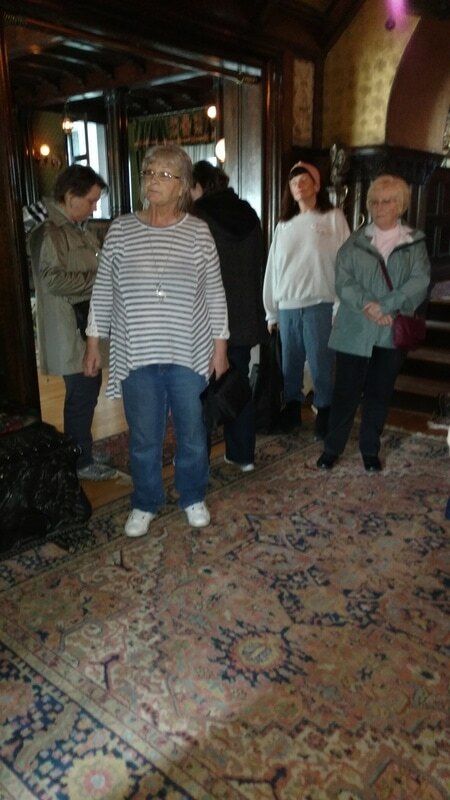 The back room was given a thorough cleaning. 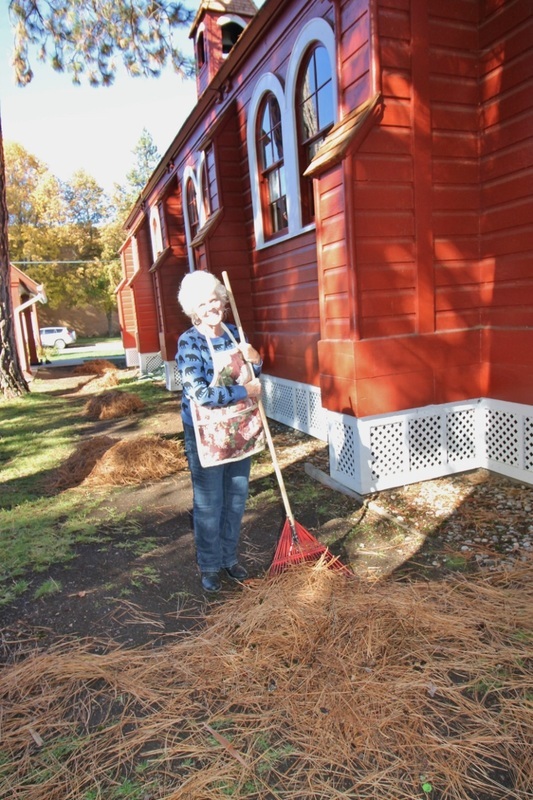 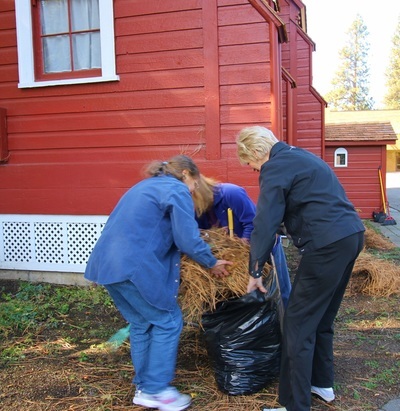 Outside our members raked and bagged approximately 8-10 large leaf bags filled with pine needles and hauled them off to the dump. This day of service was topped off with a potluck picnic afterward. 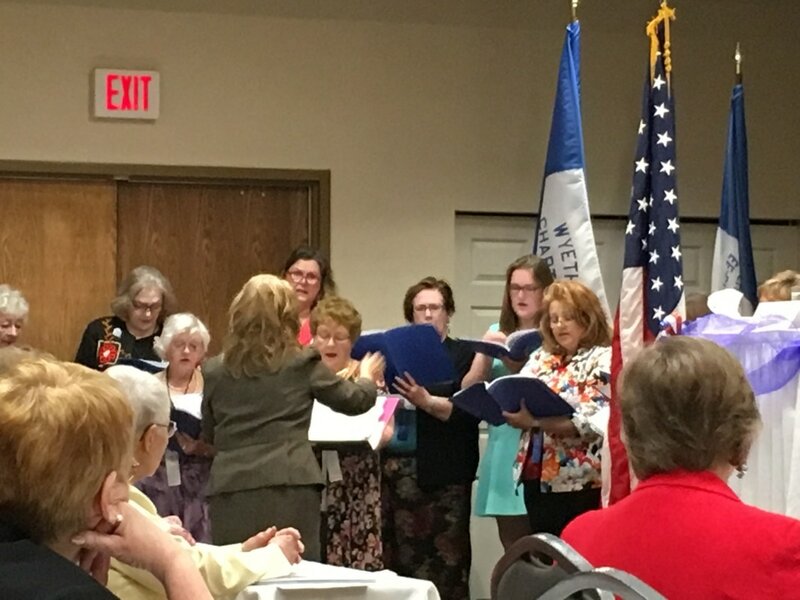 Five new members of Lt. George Farragut Chapter took the Oath of Membership at our first meeting of the 2016 - 2017 year: Alisa J., Amanda P., Angella W., Barbara H. and Kerri T. During our Committee Fair members and guests learned about the many activities of DAR. 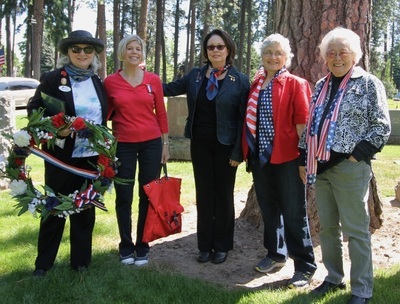 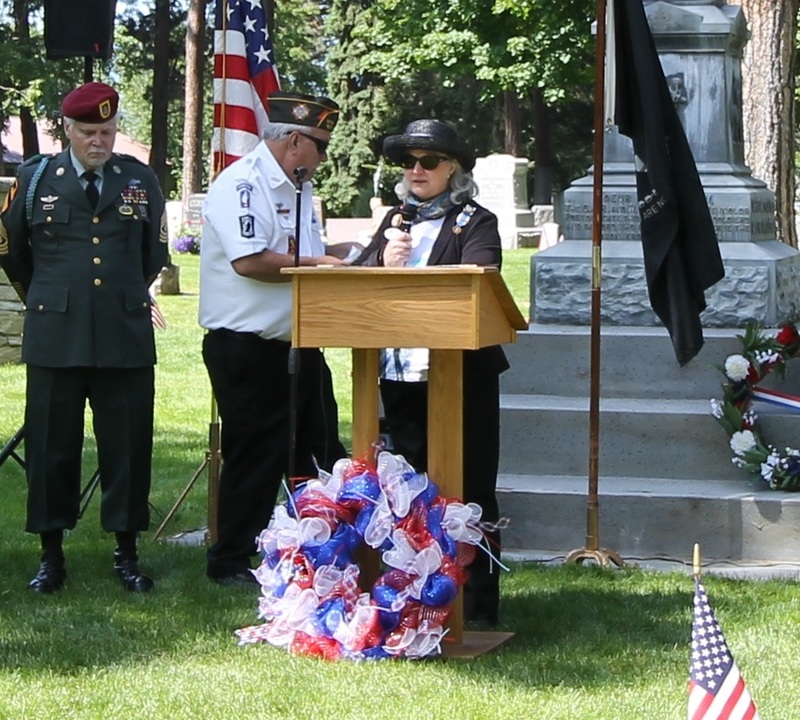 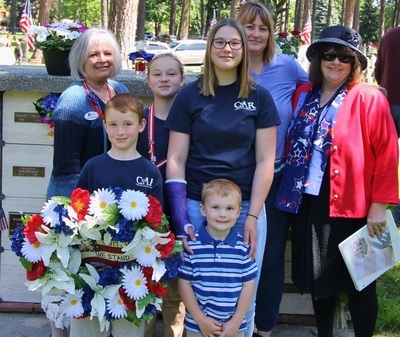 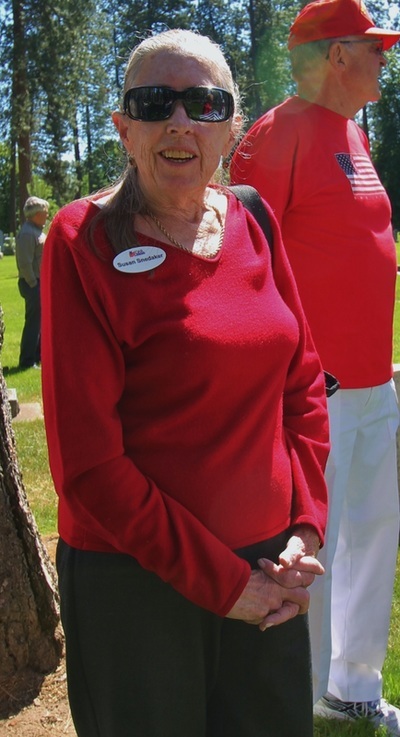 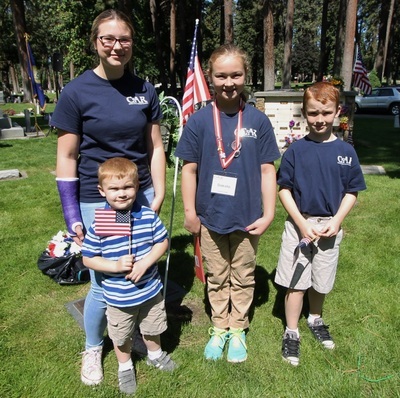 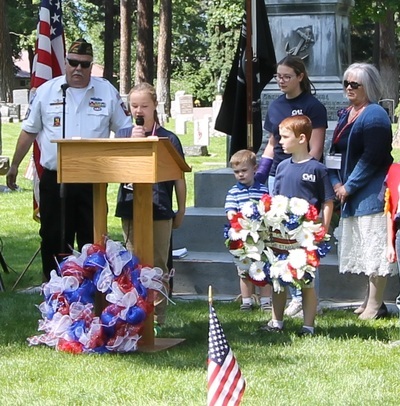 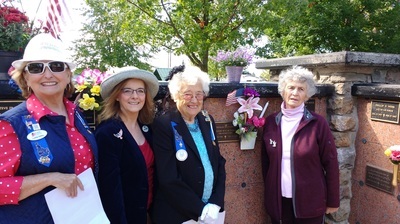 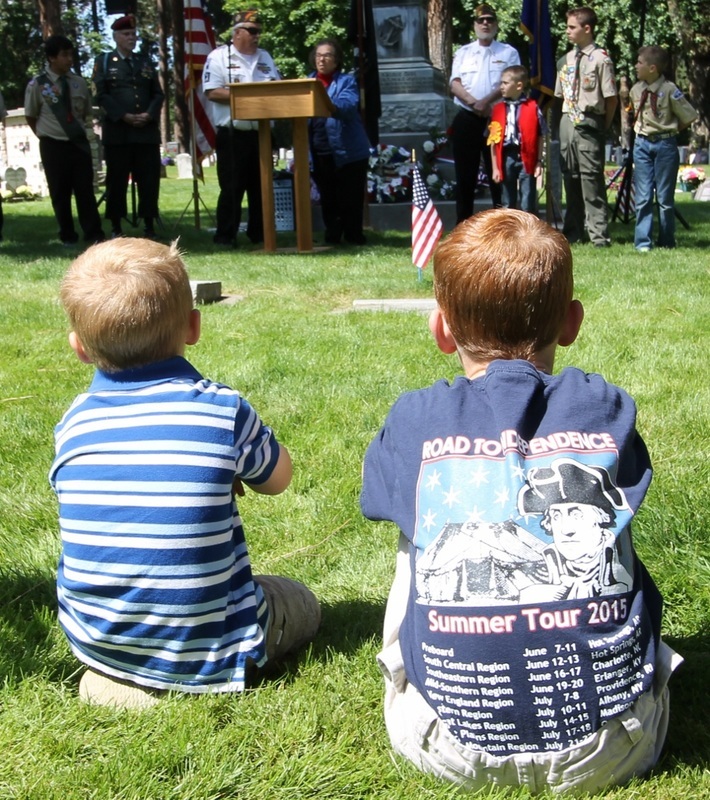 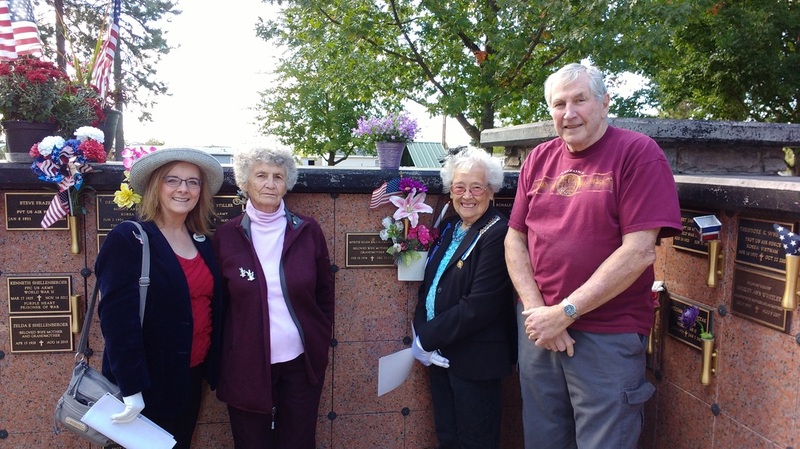 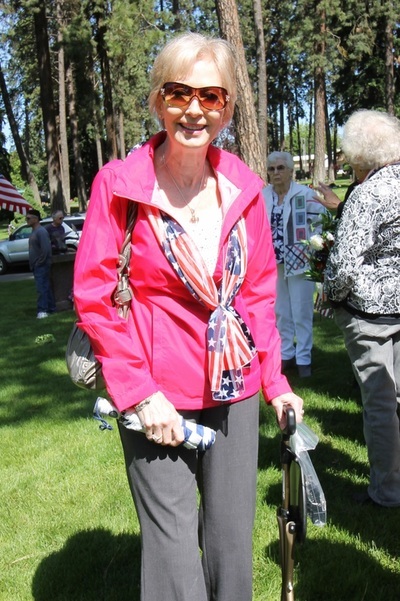 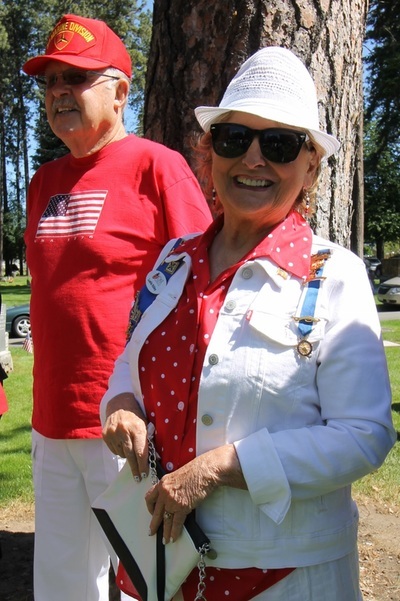 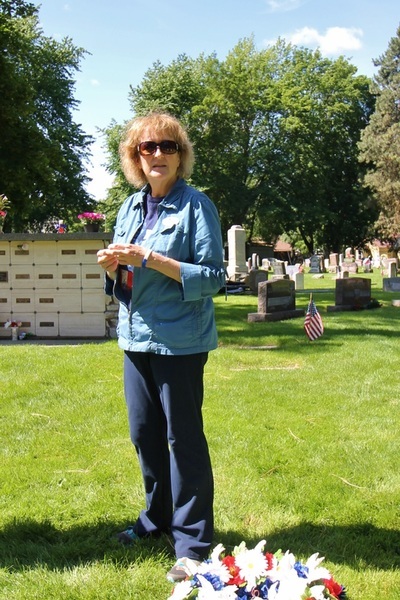 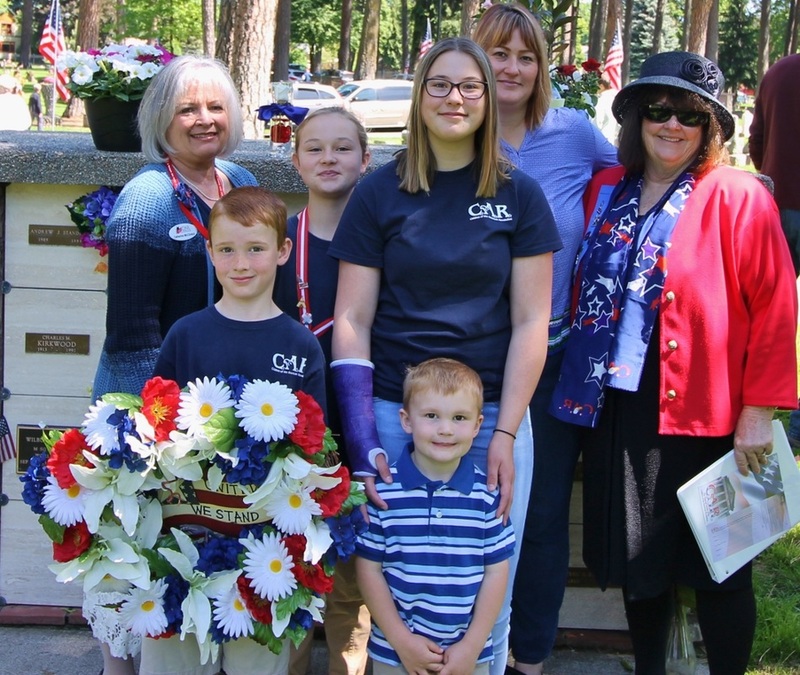 On a beautiful September day, Lt. George Farragut Chapter held a DAR grave-marker memorial service at Evergreen Cemetery in Post Falls for Myrtie Ellen Bacon-Emerson who passed in 2009 and was a member of the chapter. 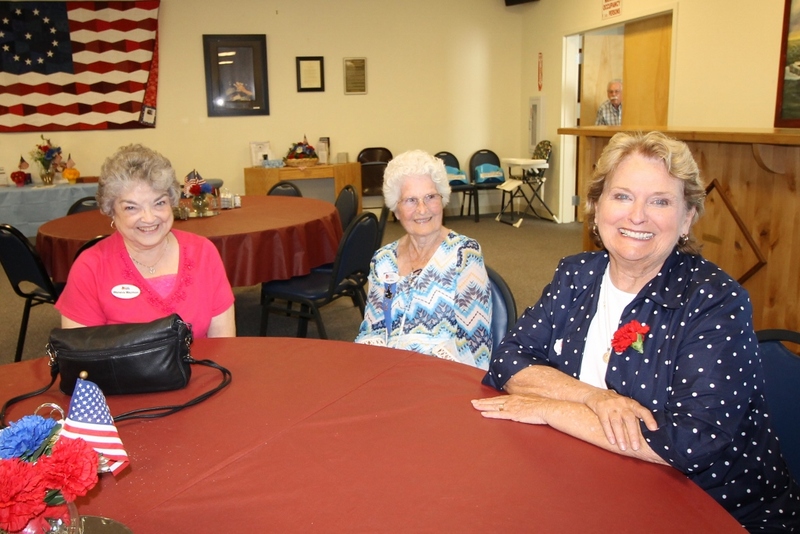 Ellen's husband, Jim, attended the service along with Ellen's sisters Louisa and Bernadine and her cousin Gail. 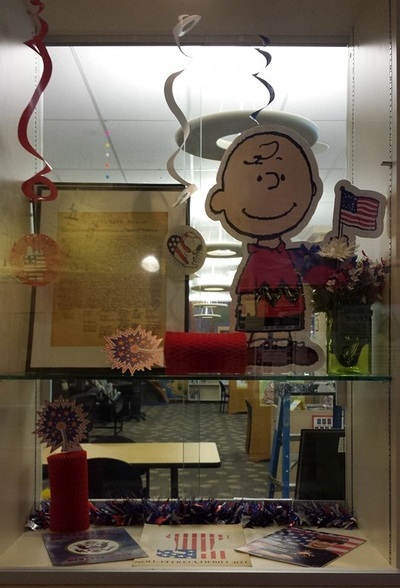 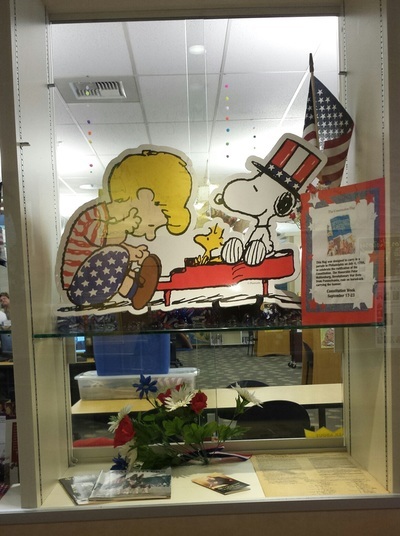 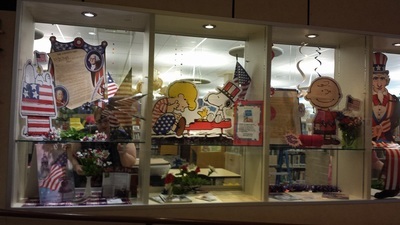 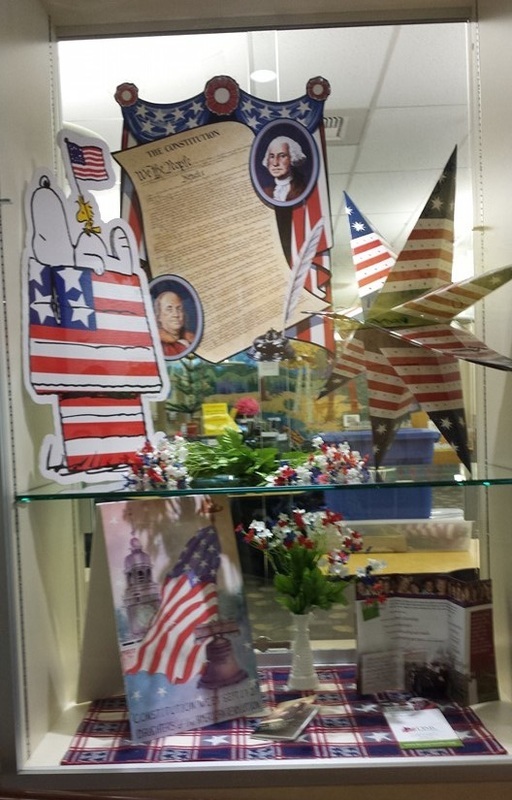 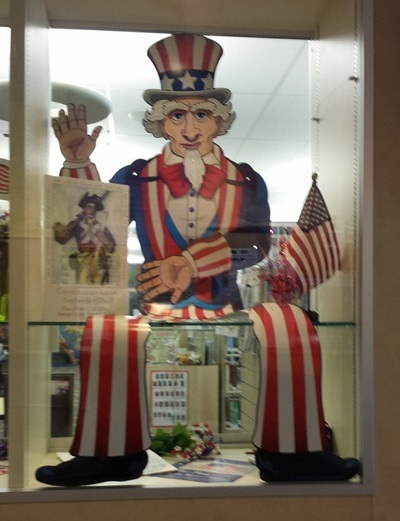 Once again Lt. George Farragut Chapter set up Constitution Week displays at our local libraries in an effort to raise public awareness of our Constitution. 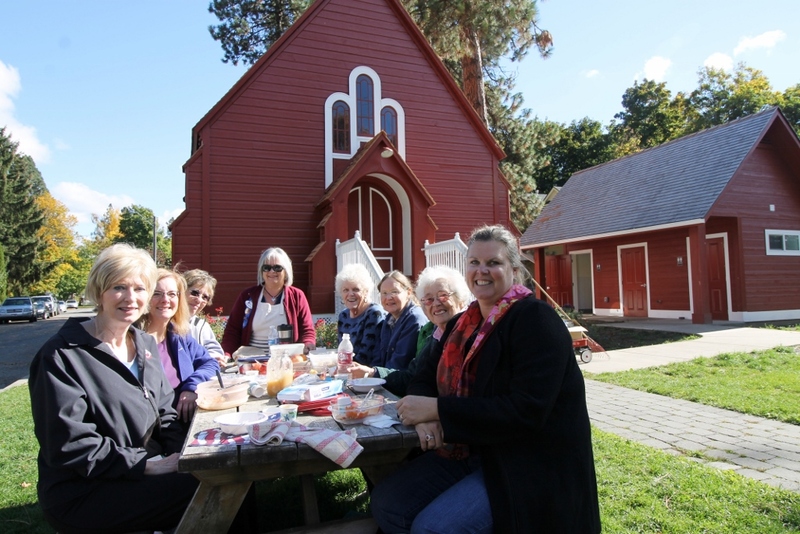 What brings a group of DAR members and prospective members together on a hot summer day? 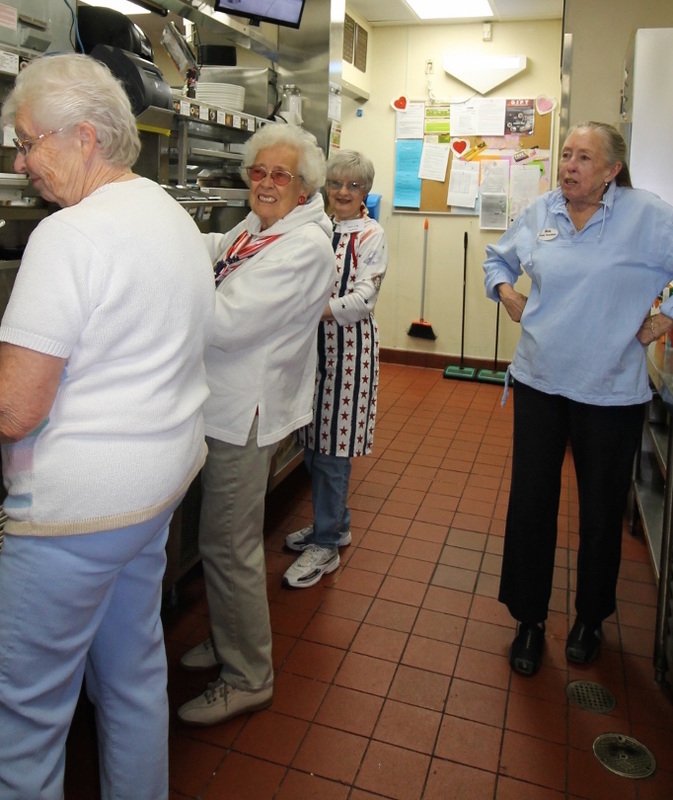 An ice cream social! 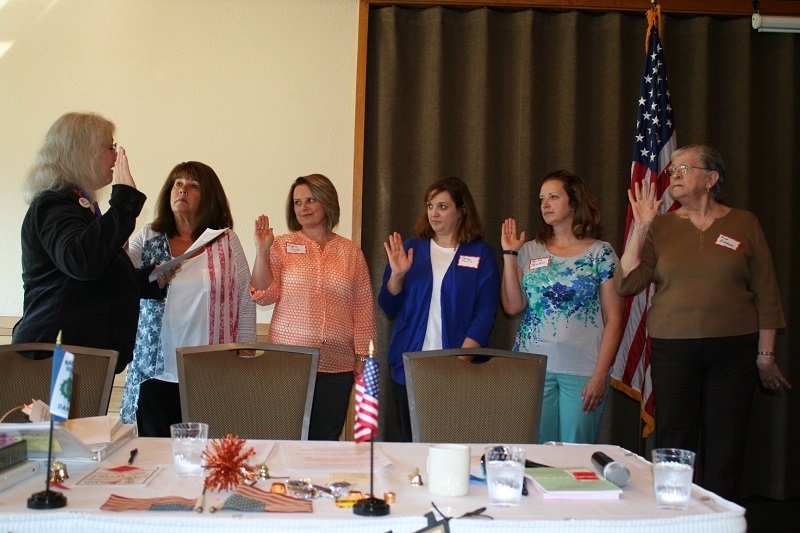 Four new members, Judith D., Maureen D., Cynthia H. and Jan N. took the Oath of Membership at this event hosted by our membership committee. 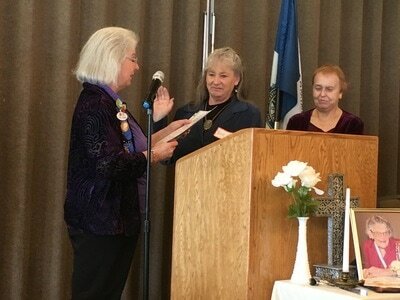 Welcome, new members! 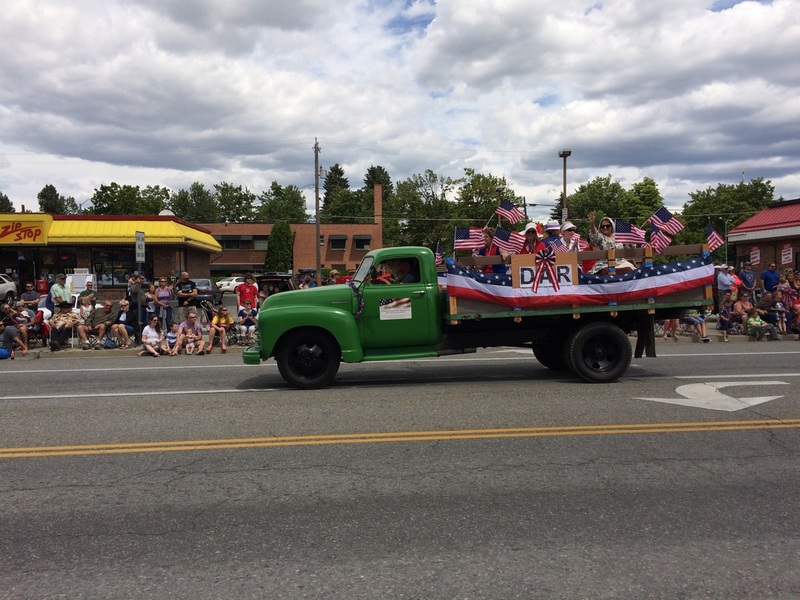 Yes, we love a parade! 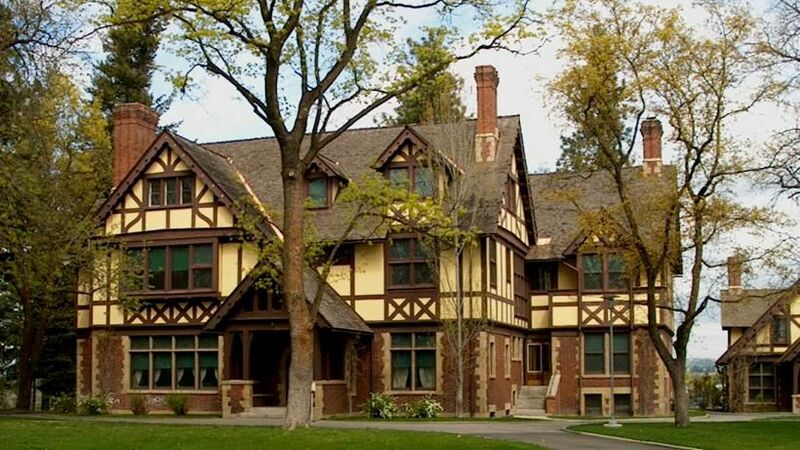 And it's even nicer when the temperature stays in the 70s with a nice breeze. 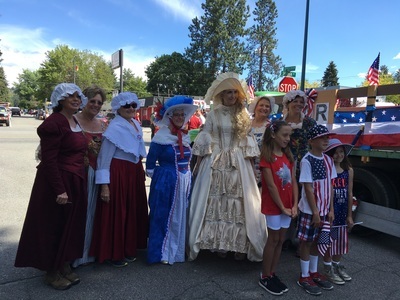 Some Lt. George Farragut members donned period attire while others opted for patriotic. 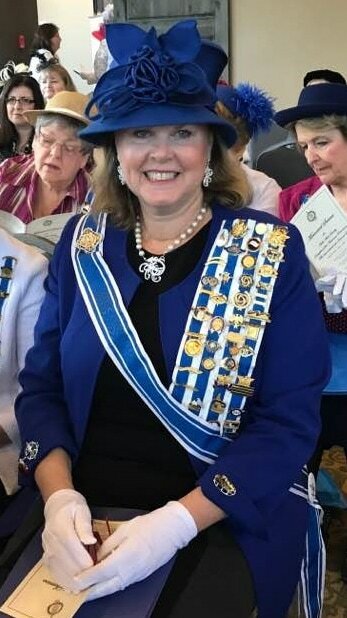 We'll remember this parade as the year when the Robideaux car carrying our chapter regent and vice president general broke down soon after the parade started. 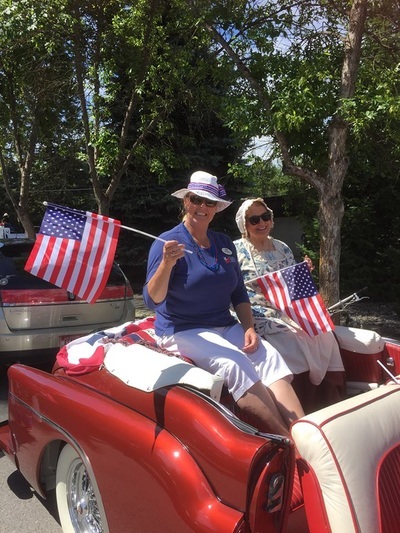 We were blessed to have helping hands from the spectators take turns pushing the car along the parade route. 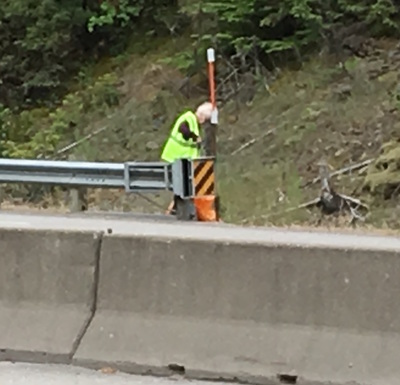 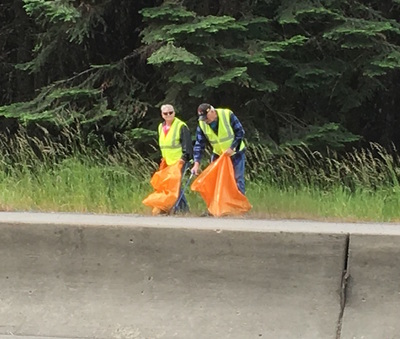 A crew of four members and one HODAR met to clean our two-mile section of I-90. Idaho introduced the Adopt-a-Highway program on April 30, 1990, to help keep Gem State roadsides clean. 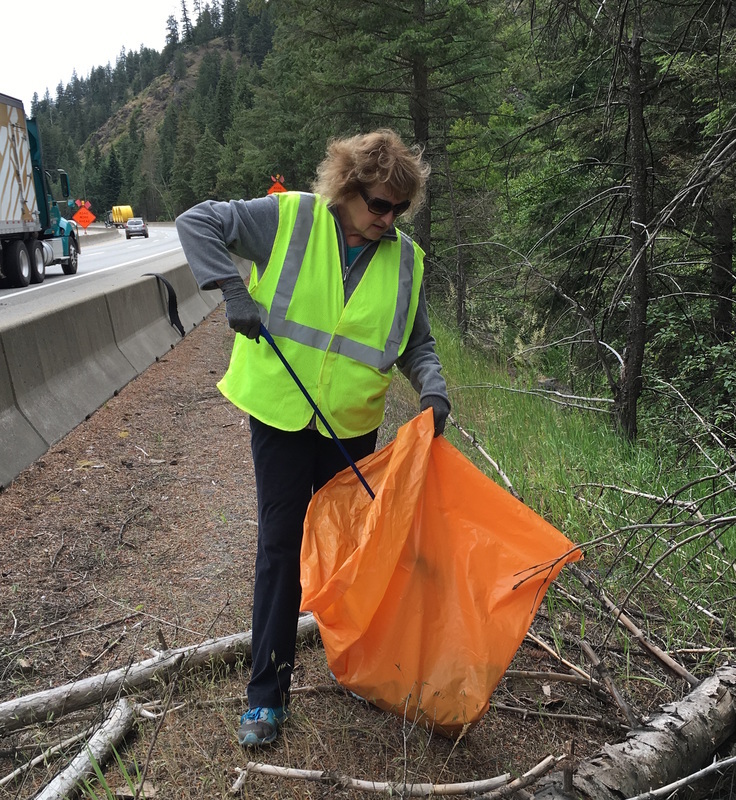 Since them over 2.5 million pounds of litter have been removed from Idaho roadsides--some of those by Lt. George Farragut Chapter over the past two years. 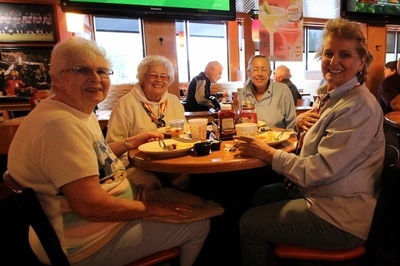 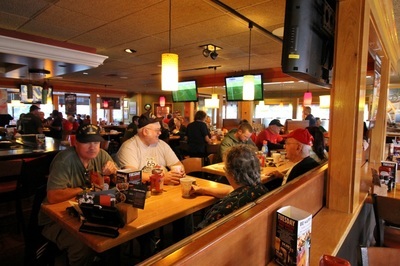 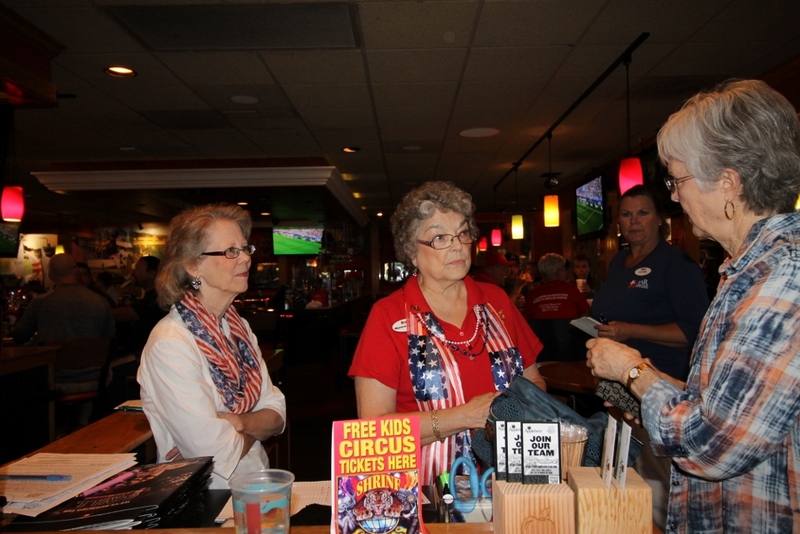 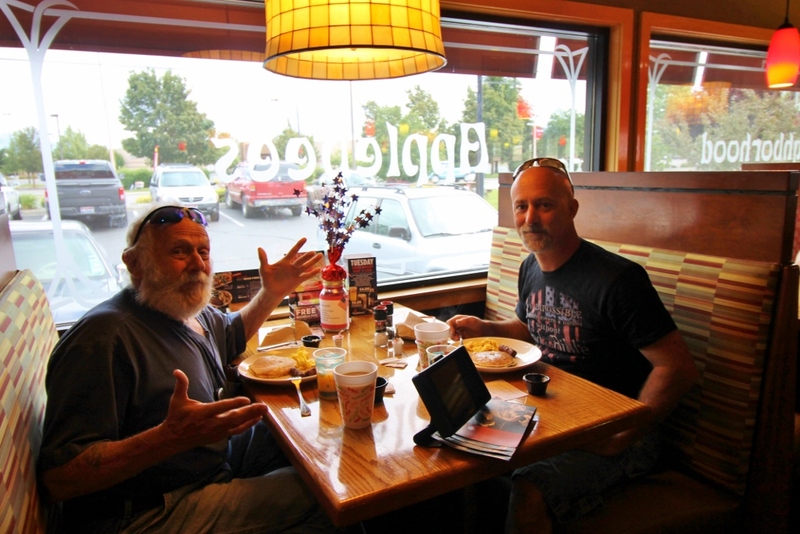 For the 5th time in as many years, Lt. George Farragut Chapter hosted an all-you-can-eat pancake breakfast at Applebee's. 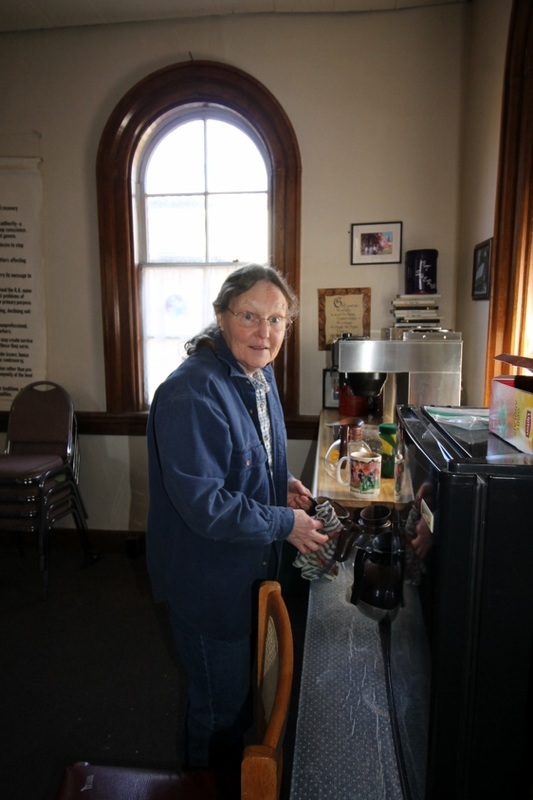 Members and friends of DAR turned out to serve 130 breakfasts to hungry customers on a cold June morning. 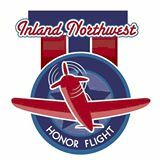 At the end of the morning we had earned over $2,300 for Inland Northwest Honor Flight, Newby-Ginnings, Cowgirls and Women Warriors and other local veterans projects.